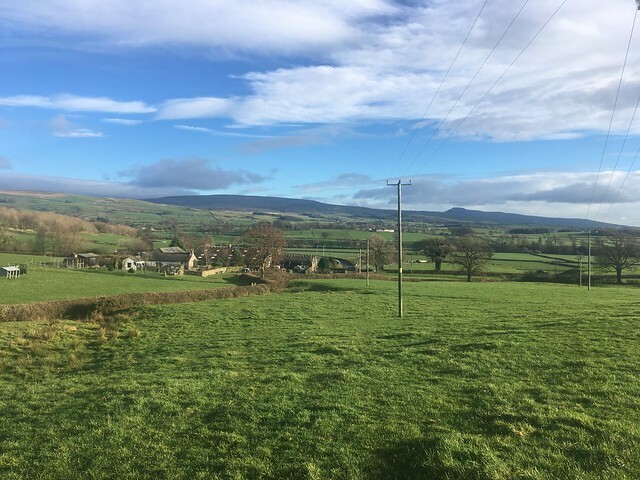 I had a week in Ireland this week cancelled and as I hadn’t anything particularly urgent that needed doing, I thought that, weather permitting, we might get out for a walk one day. Checking the forecast, Monday looked the best bet as it was expected to be a decent day, so that clinched it. Where to go? 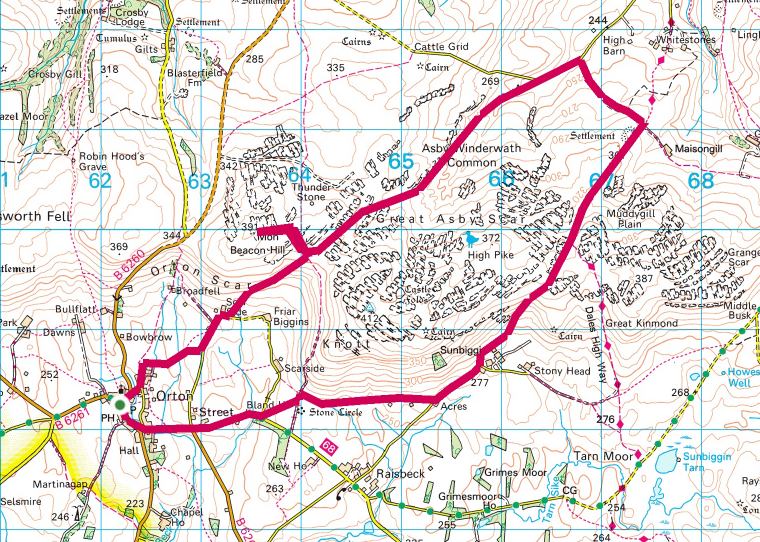 Given the limited hours of light in December we decided not to go to far and stick to a low level route, limiting the mileage. 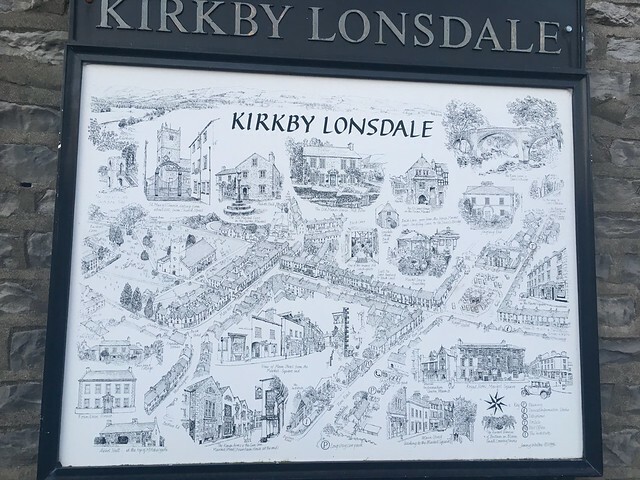 We’d not been to Kirkby Lonsdale before, even though it’s not so far away (just over an hour’s drive, M6 willing! ), so after a little research decided on a route starting from there. 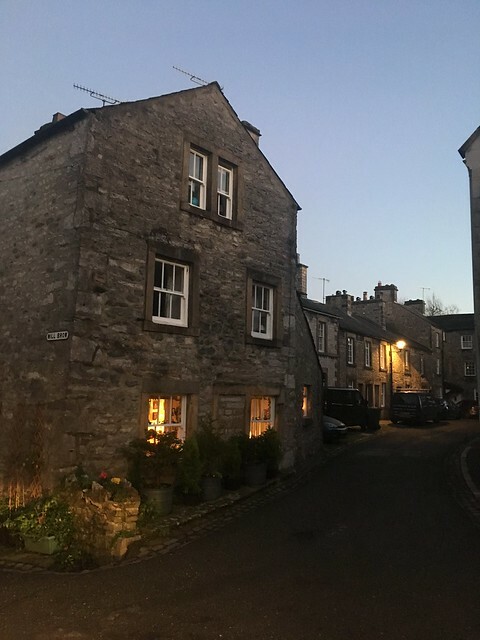 Kirkby Lonsdale is a picturesque market town in Cumbria, close to the boundaries of both Lancashire and North Yorkshire and just inside the Yorkshire Dales National Park. 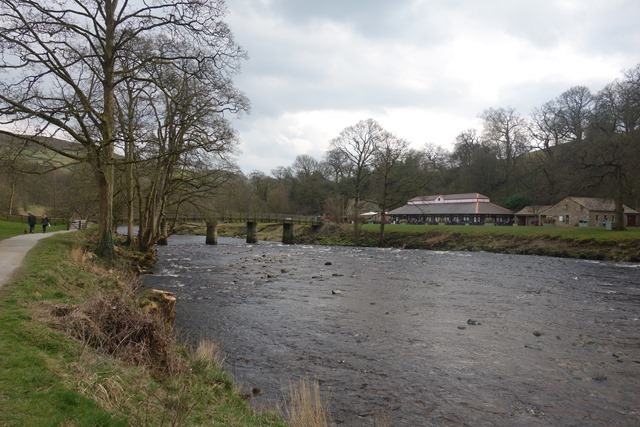 It’s noted for it’s olde worlde town centre, a viewpoint beloved of Ruskin and Turner and an old bridge. 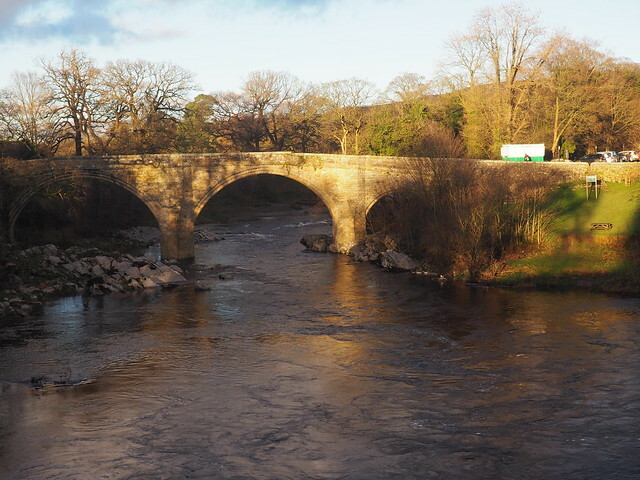 There’s plenty of free parking on the edge of town, either side of the “Devil’s Bridge” but when we arrived on a Monday morning in December, I was surprised to see how many cars were parked up. 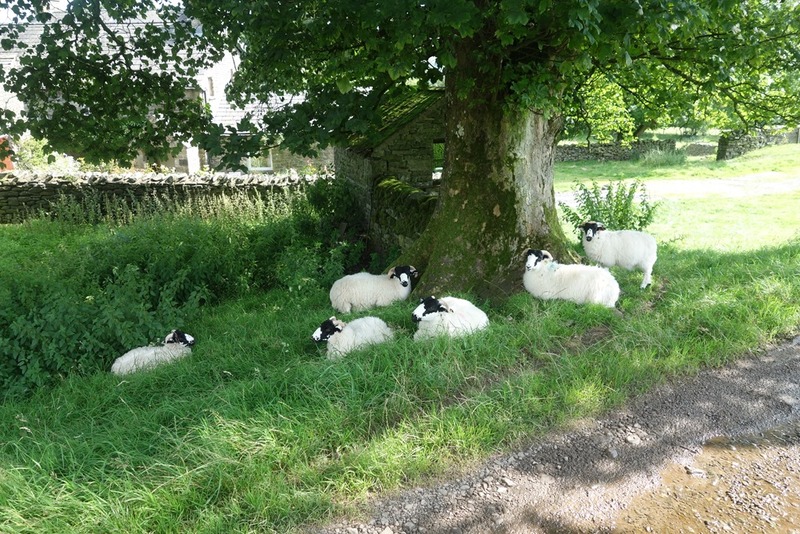 However, there were a few spaces left so we parked up and donned our boots ready for a walk. 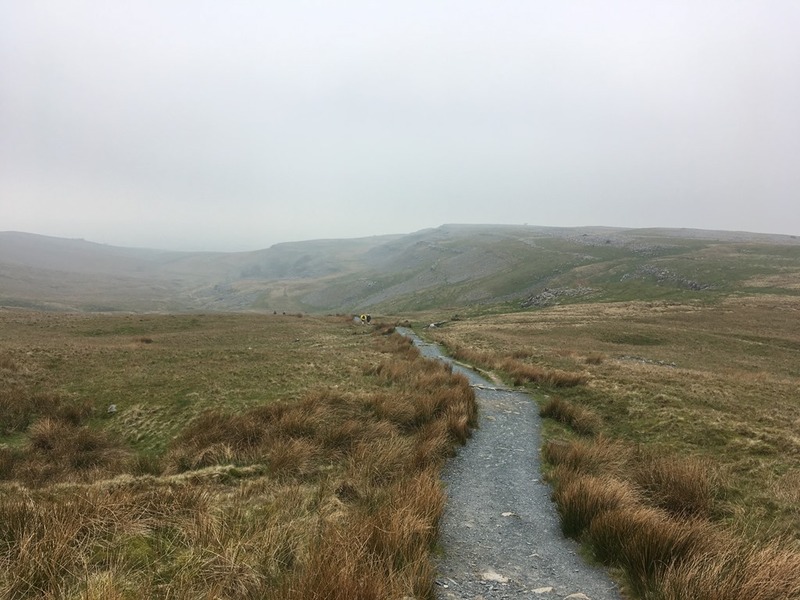 I was expecting it to be muddy so we’d brought our gaiters and a couple of walking poles – it turned out that this was a good move! 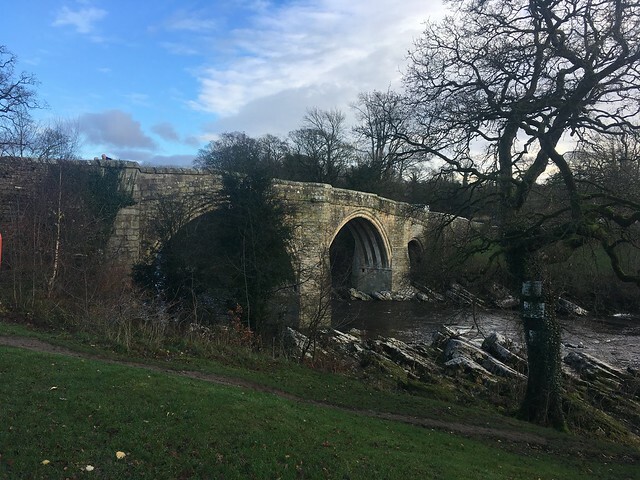 Before setting off we had a look at the Devil’s Bridge which was built in the 12th or 13th century, and is now a scheduled ancient monument. 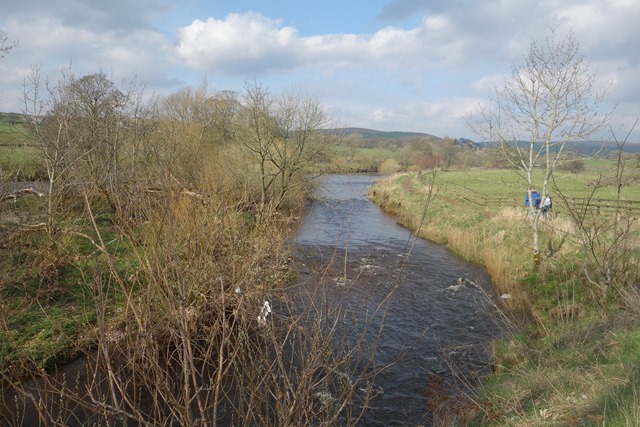 At one time it was the only bridge over the Lune for miles around. 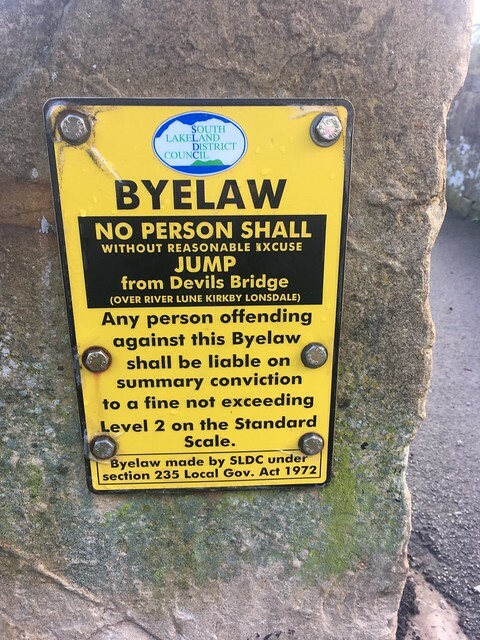 There are quite a few Devil’s Bridges around the country, all built around the same period and all have a story associated with them explaining the name. 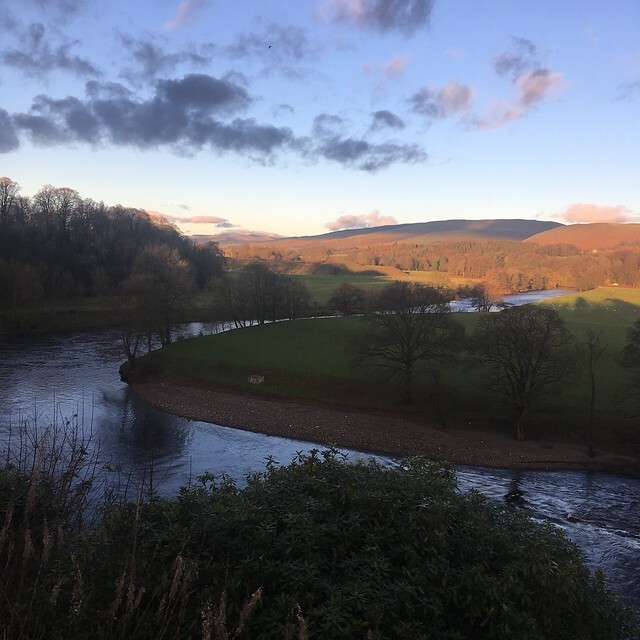 At Kirkby Lonsdale the tale goes that one night a cow belonging to an old woman strayed across the river and as there was no crossing point on the wide, fast flowing river, she couldn’t get it back. 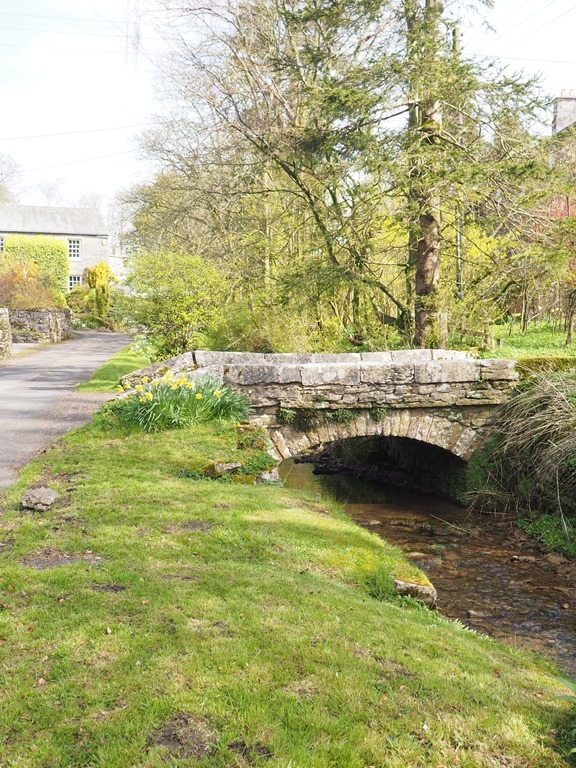 The devil then appeared and offered to build a bridge overnight t if he could have the soul of the first one across. However, the old woman fooled him by sending her dog across first. The devil was so angry he disappeared in a cloud of smoke never to return. 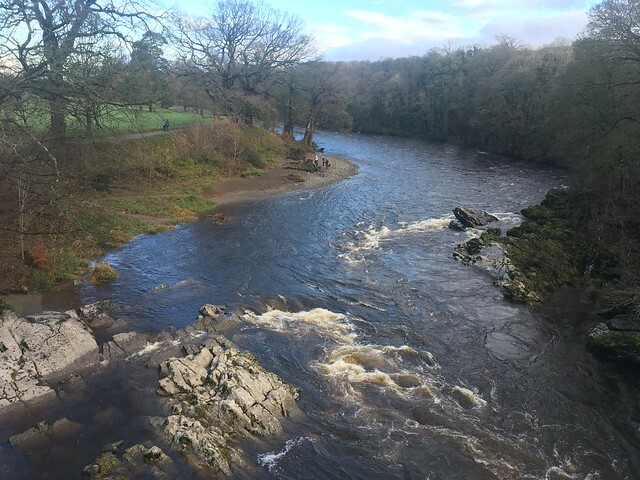 The bridge is a popular spot over the River Lune for “tombstoning”, which involves leaping from height into water. Over the years a number people have been killed here and there’s a local bye-law forbidding the practice, but, apparently, this doesn’t stop some foolish thrill seekers. So perhaps the Devil has had the last laugh. 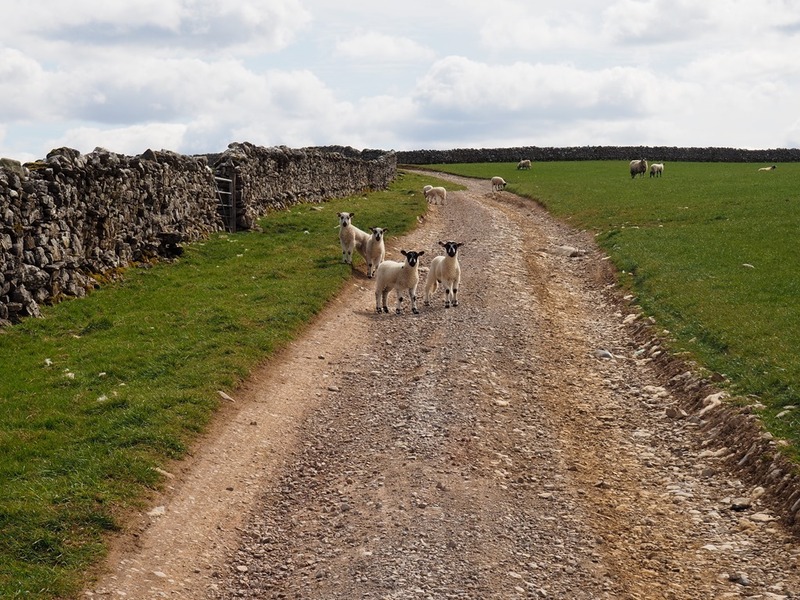 We set off , crossing the main road and then heading off south through the fields. 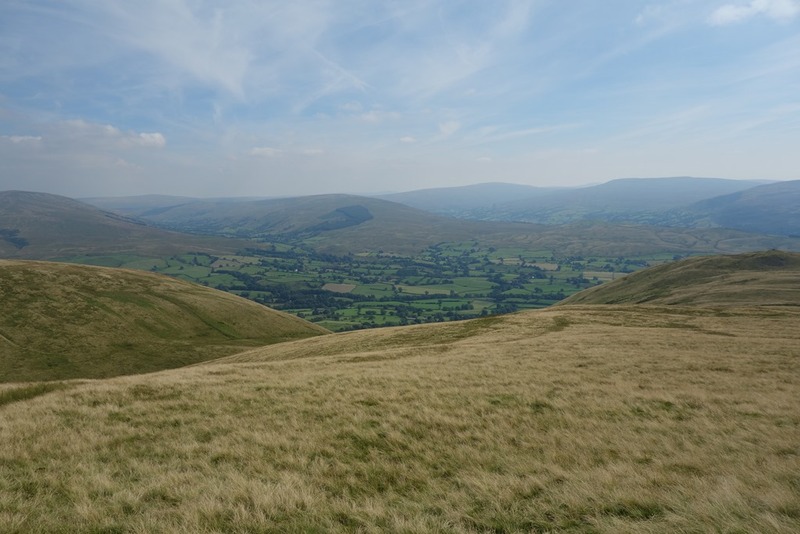 There was a good view over to the Kentmere horseshoe. Passing a small group of cottages we followed the track which led towards Sellet Mill. 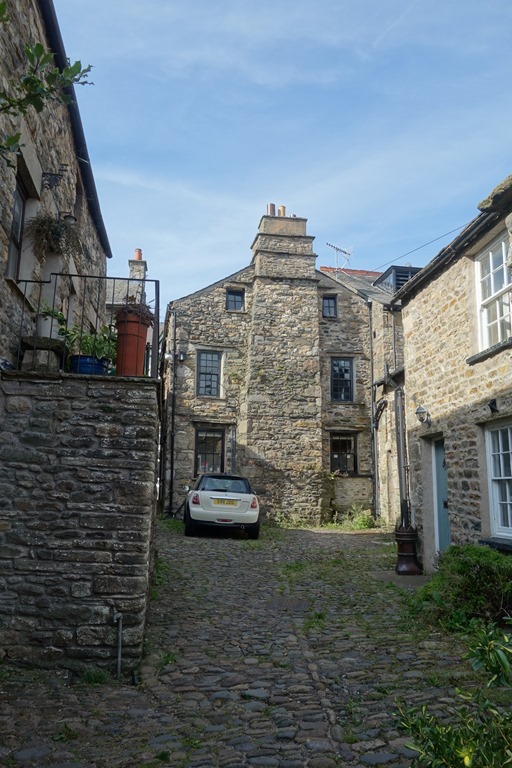 The narrow footpath passed between two stonewalls and was clearly an old right of way which looked like it had been cobbled at one time. 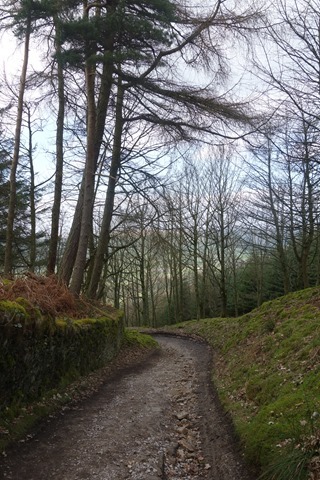 About a third of the way down a stream came in from the left and the path continued alongside it. “I wonder if it ever gets flooded?” We soon found out. Not much further on the path was covered with a fast running stream. Should we turn back or chance it and continue? We took the latter option. 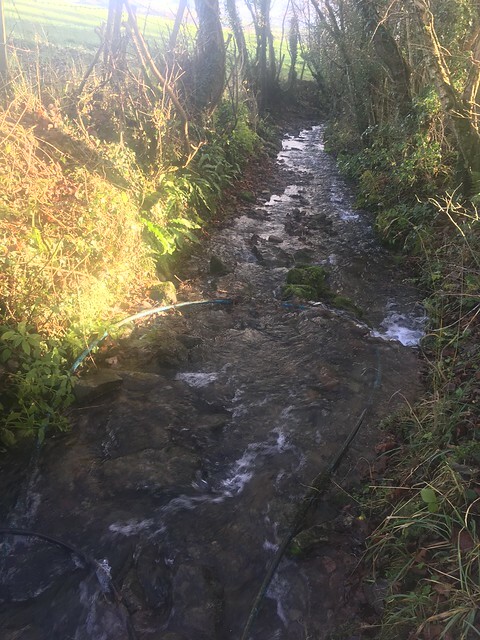 We almost regretted this decision as the water was quite deep in places and it wasn’t easy to avoid getting our boots submerged or slipping and falling over. 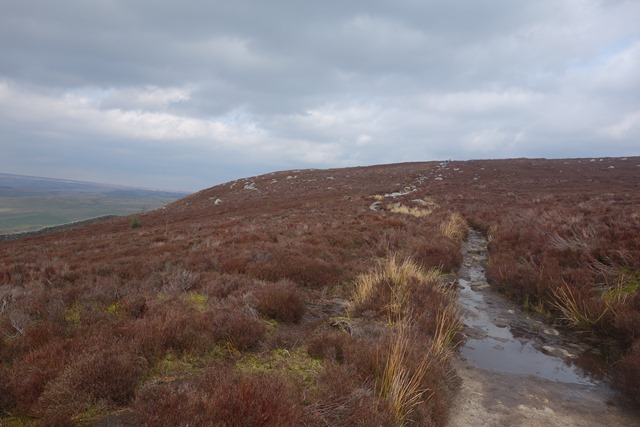 The walking poles now came in very handy and we managed to stay upright and not get too wet thanks to the gaiters. 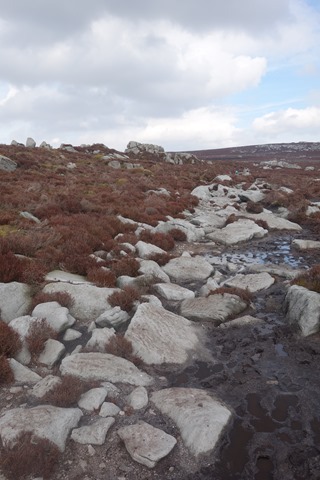 After what seemed a long way the path re-emerged on the right hand bank and we were able to continue on dry land until we reached Sellet Mill. From here we took the path heading west through the fields until we reached the road and then followed a narrow minor road towards Whittington, a pleasant old village. 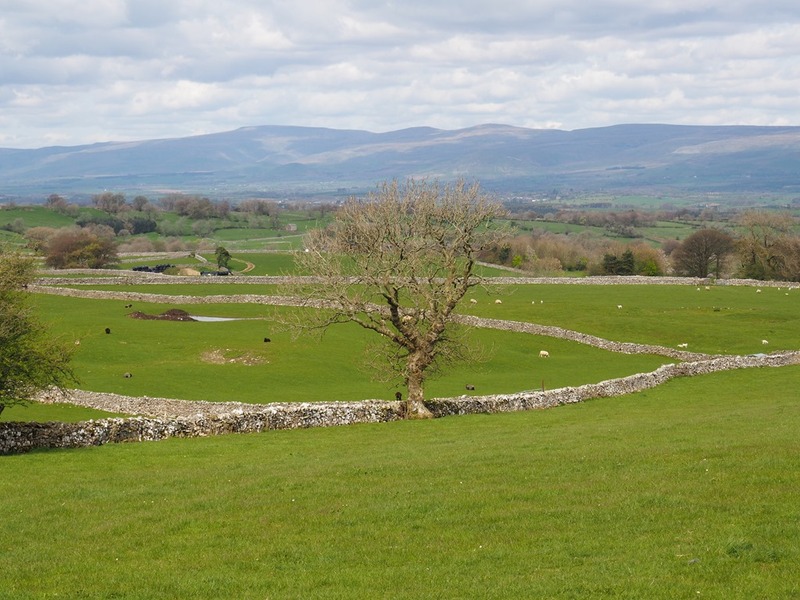 There were good views over the fields across to Ingleborough and other hills in the Yorkshire Dales National Park. 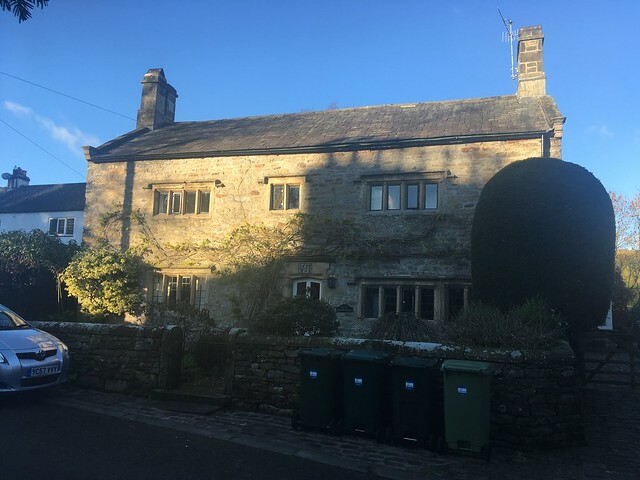 and we passed some interesting old buildings. 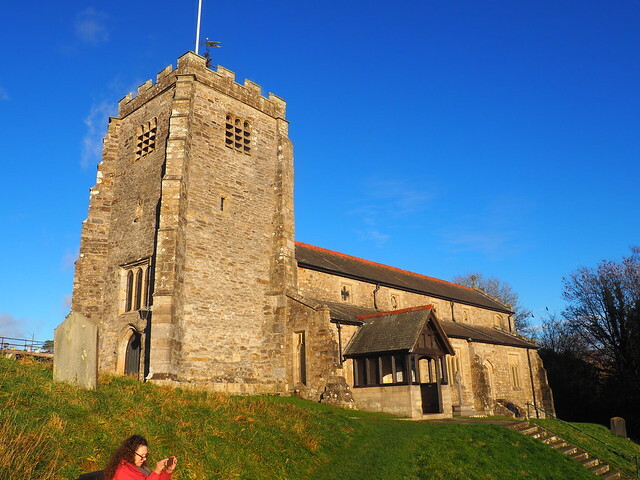 Reaching the old church, which stands on the site of a Norman motte and bailey castle, we decided to stop and have a bite to eat. 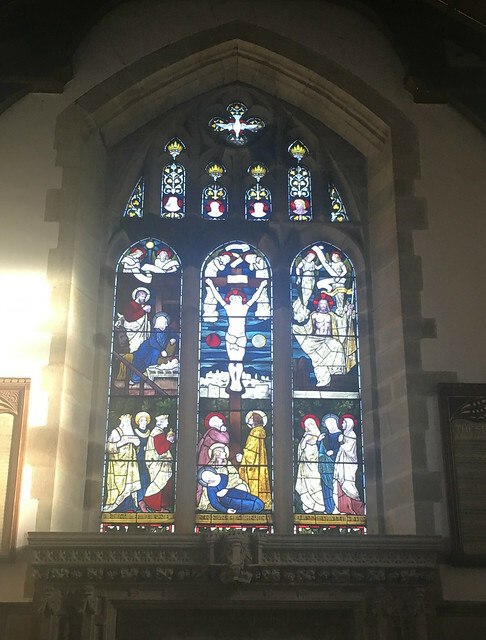 We had a quick look inside the church. 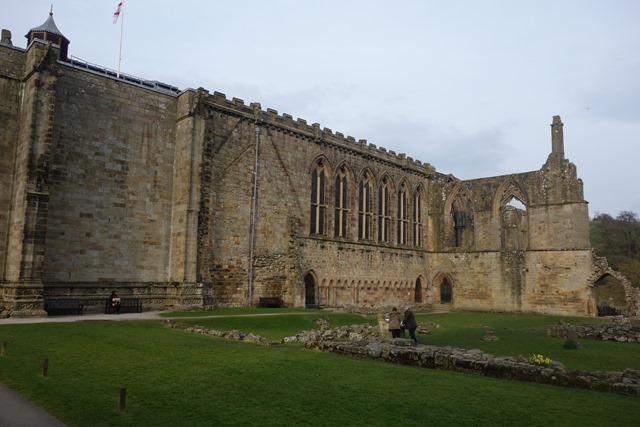 The oldest part is the tower, which dates from the early 16th century. 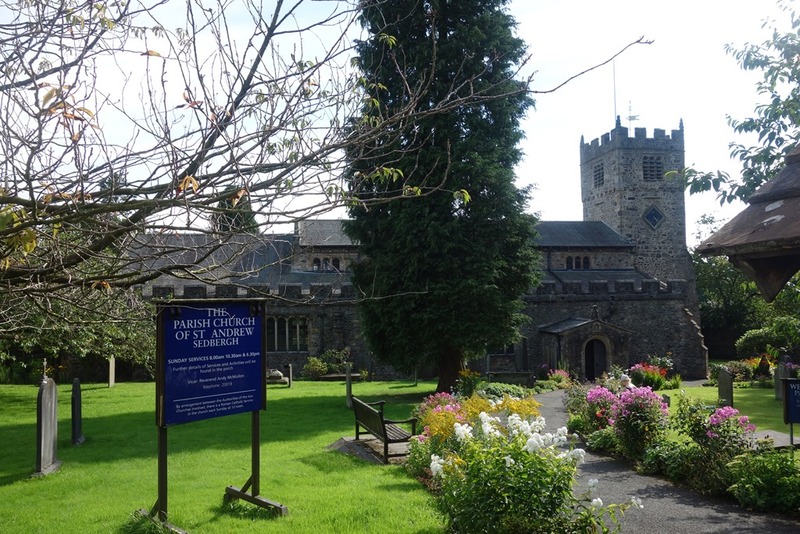 The rest was largely rebuilt in 1875 in the usual Victorian Gothic revival style. 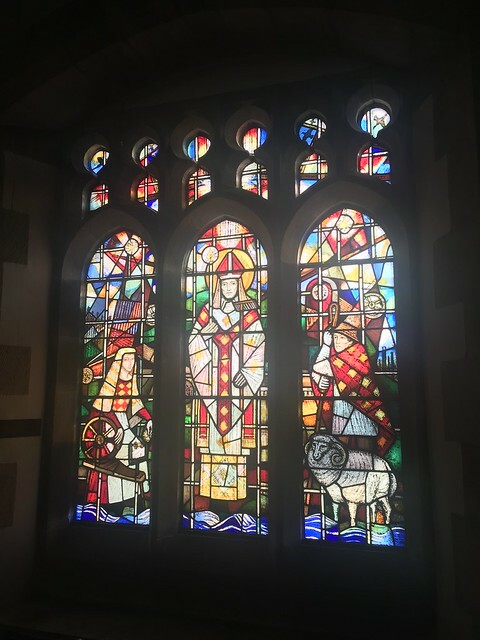 There was some rather nice stained glass. 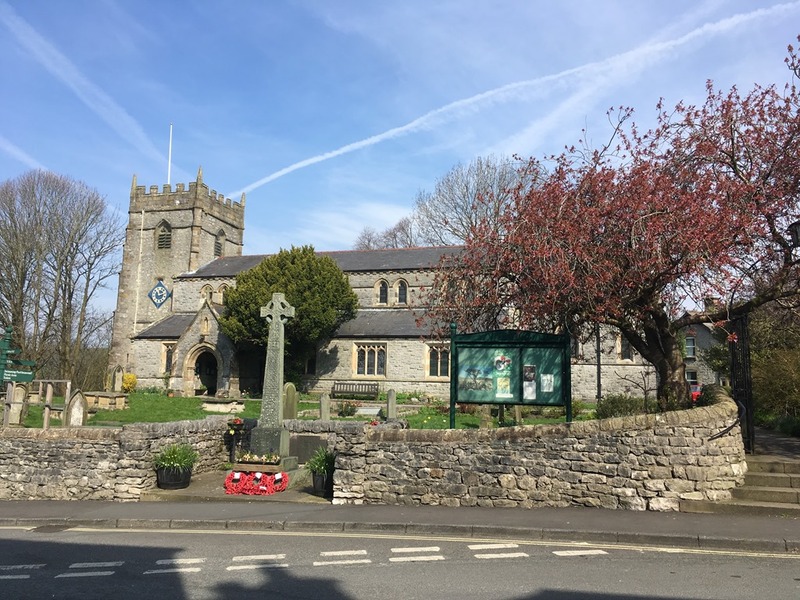 Afterwards we found a bench in the graveyard and sat down to eat our pork pies, taking in the view on a pleasant, sunny, afternoon. 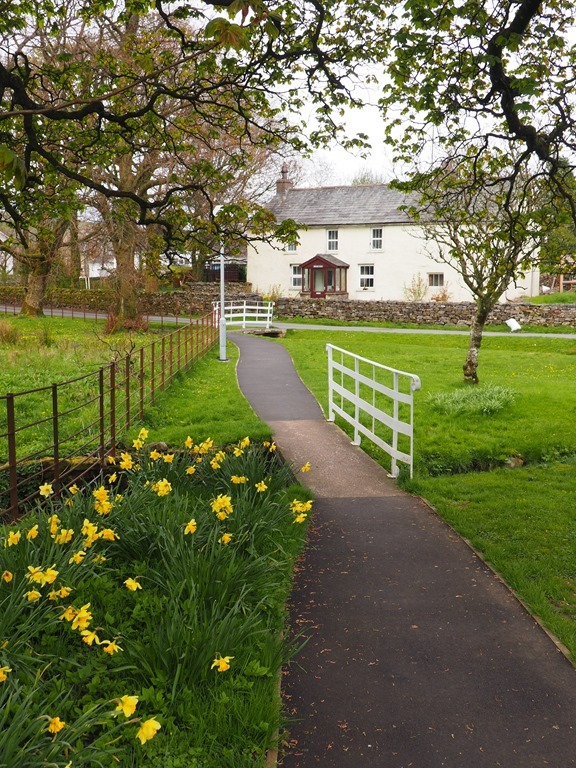 Well nourished we resumed our walk, taking the road through the village and then followed a path that cut eastwards across the fields towards the River Lune. 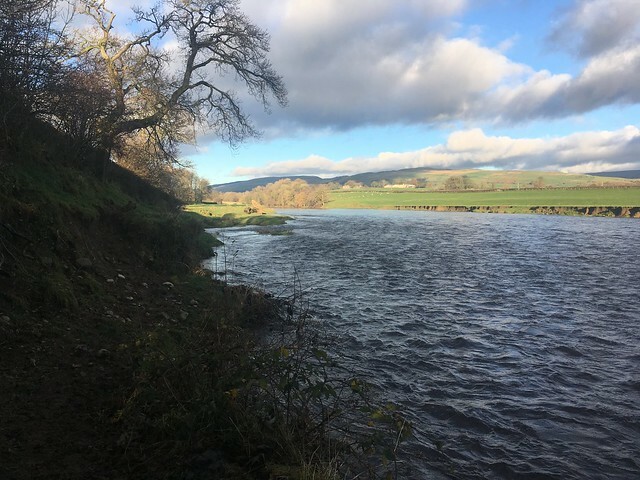 After recent heavy rains, the river was deep and flowing fast and the banks were muddy and slippy. 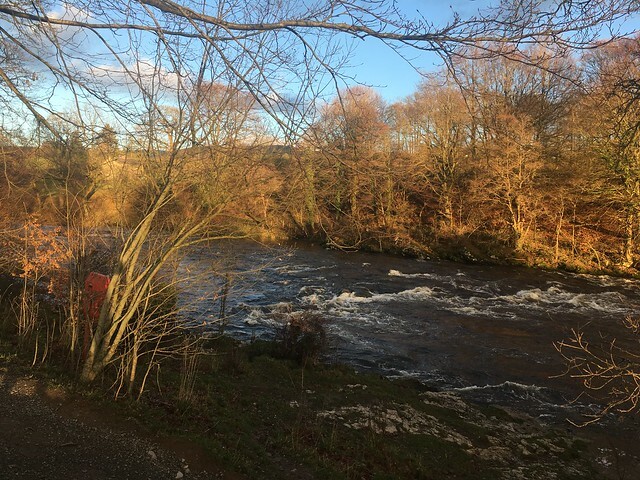 In a few places it was close to the river and we were once again glad I’d put our walking poles in the boot of the car that morning. 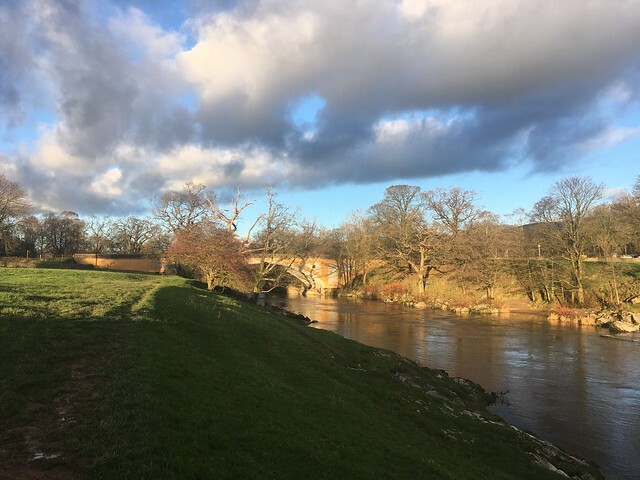 We followed the river bank back to Devil’s Bridge and then continued on the riverside path as we wanted to have a look around the small town and also to visit the viewpoint known as “Ruskin’s View”. 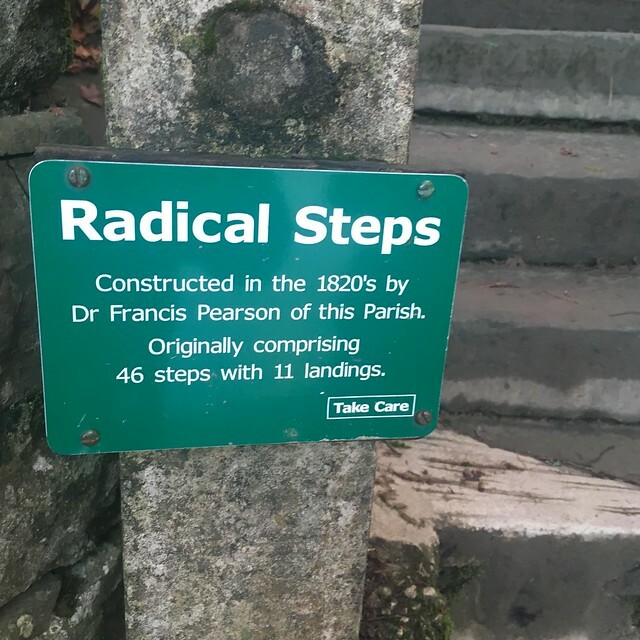 After about a mile we reached the “Radical Steps” that would take us up to the viewpoint. 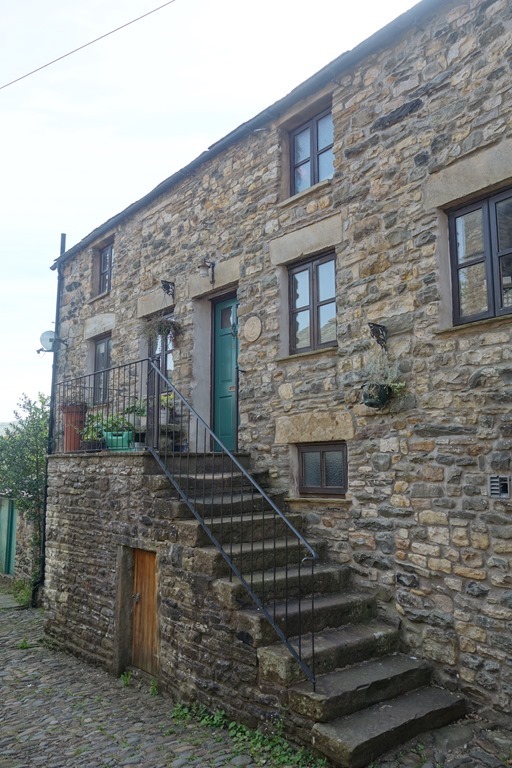 The steps were built in 1819 by Francis Pearson, a local Liberal. The locals came to call them the Radical Steps on account of his political leanings. 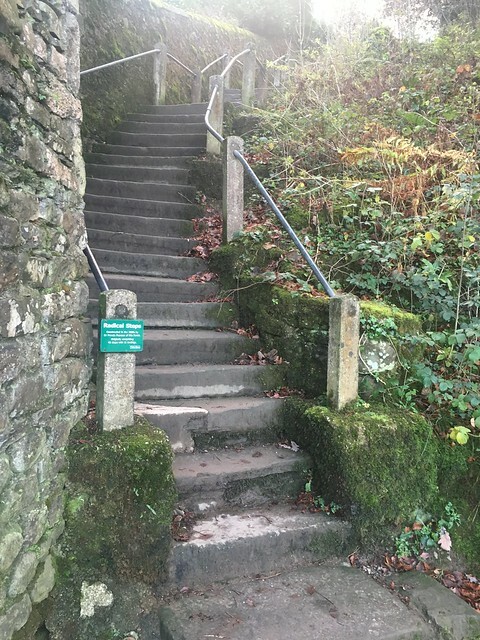 There are allegedly 86 stone steps, although we didn’t count them. 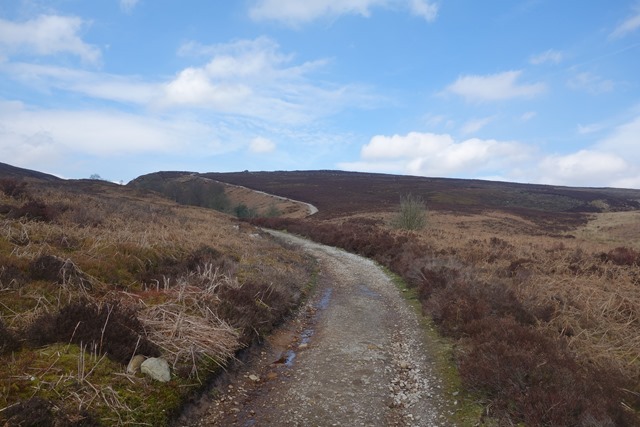 They were rather steep and uneven and probably easier to go up than down. 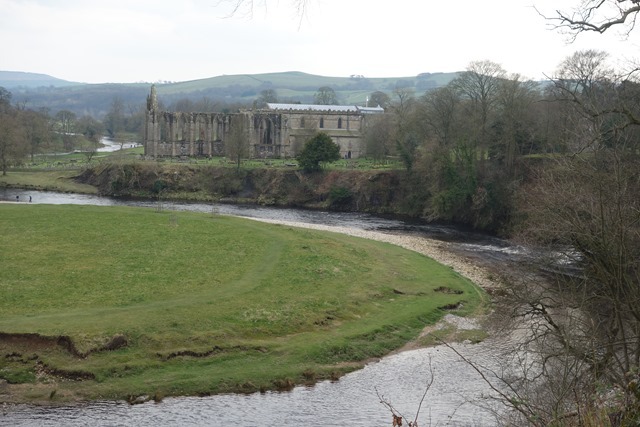 At the top of the steps we reached the edge of the churchyard and were able to take in “Ruskin’s View”. Painted by Turner, in 1875, John Ruskin described the panorama as ‘one of the loveliest views in England, therefore in the world’. 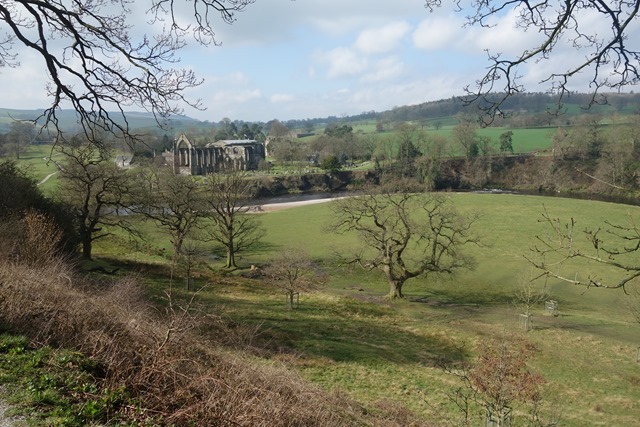 Even though the river valley was now in the shade, it was certainly a lovely view, but I think Ruskin was rather overstating it. and then wandered into town where we found a cafe to have a brew before heading back to the car for the drive home. It was only 5 o’clock but the winter sun having already set it felt much later. But we’d had a good day out. 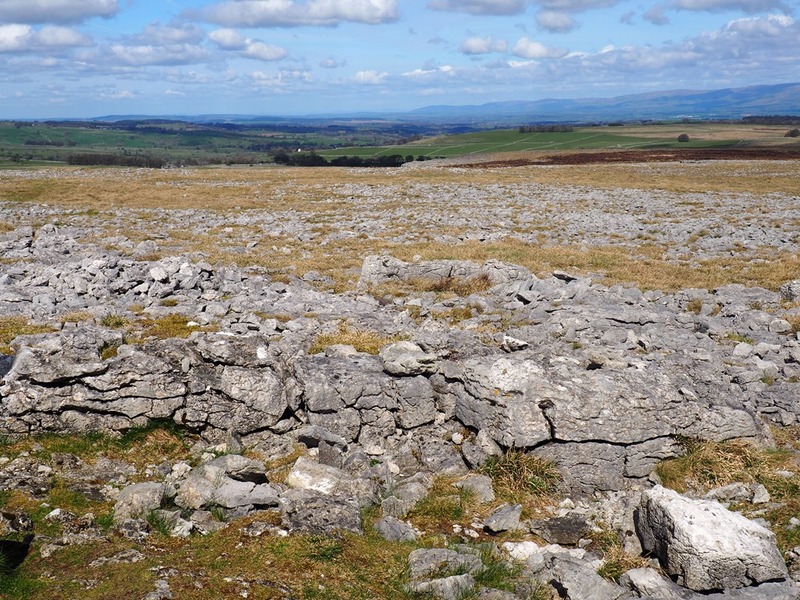 Before we went up to Orton for our walk around the limestone pavements I’d spotted that there was one of Andy Goldsworthy’s sheepfolds not so far away near the small hamlet of Raisbeck. 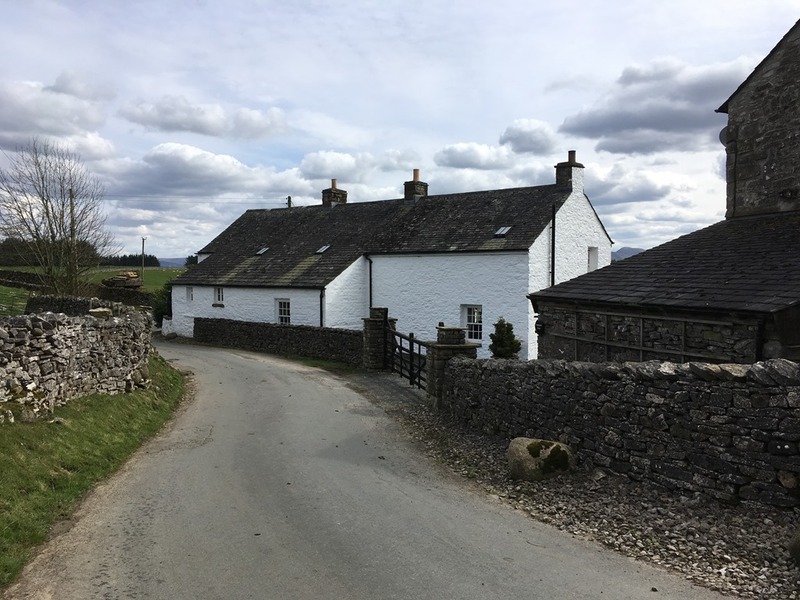 SHEEPFOLDS is Cumbria County Council’s major county-wide sculpture, landscape and environment project by the internationally renowned artist ANDY GOLDSWORTHY. The project started in January 1996 for the ‘U.K. Year of Visual Arts’ in what was then the Northern Arts Board region. 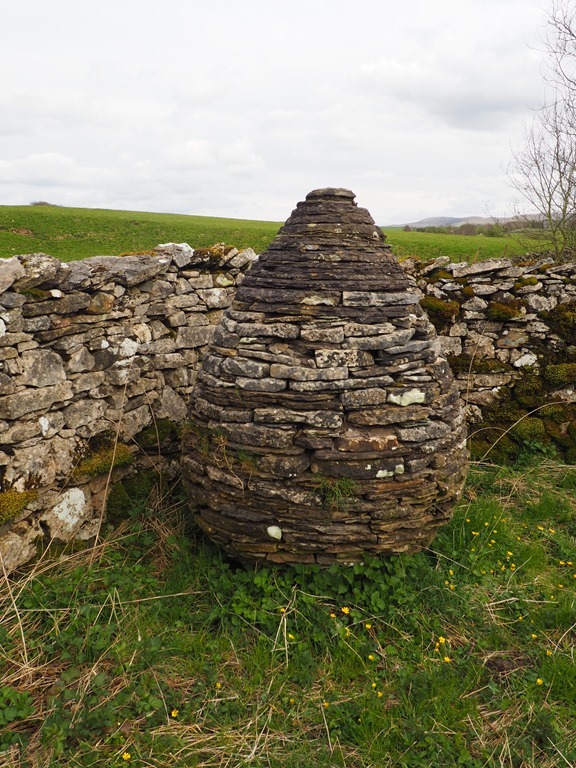 Beginning as part of this programme Andy Goldsworthy has created a body of environmentally responsive sculptural works across Cumbria using existing sheepfolds, washfolds and pinfolds. Although each fold is an individual piece, the project should be seen as a single work of art . 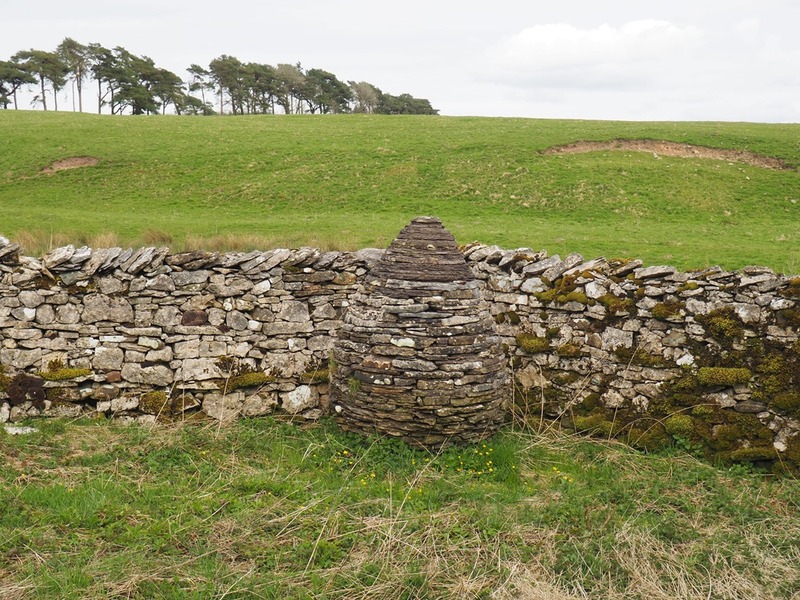 The one at Raisbeck is one of the artist’s cone pinfold’s. 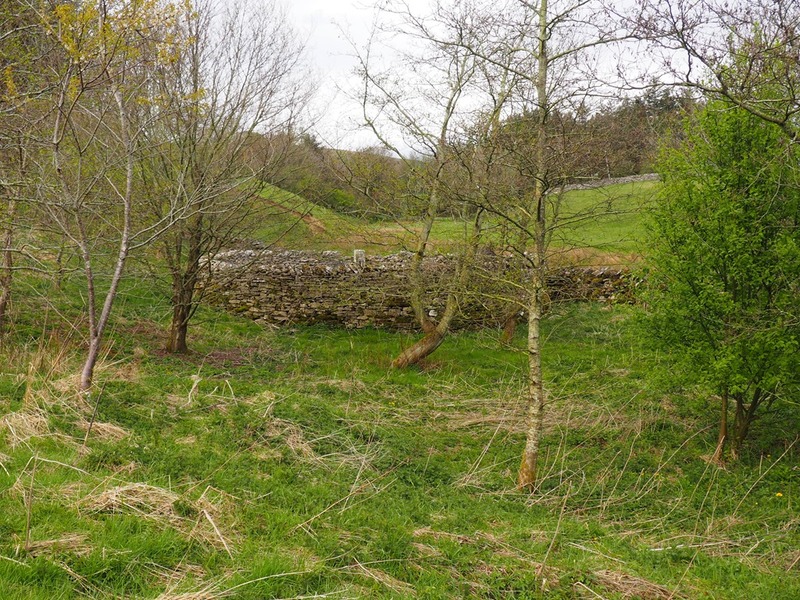 Pinfold appears to be a northern term for a pound, where stray animals were kept until claimed by their owners who would have to pay a release fee. If unclaimed, the animals would be sold. 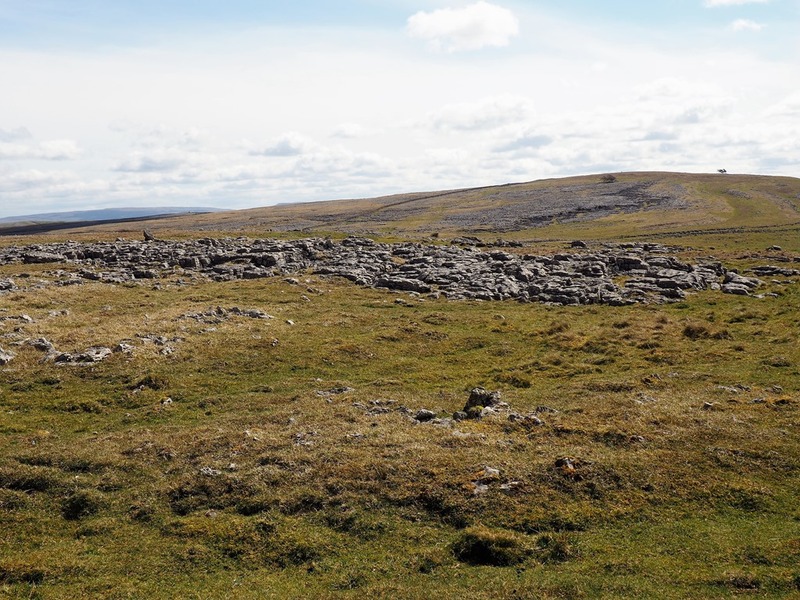 The Raisbeck cone features in a book about the sheepfold project. 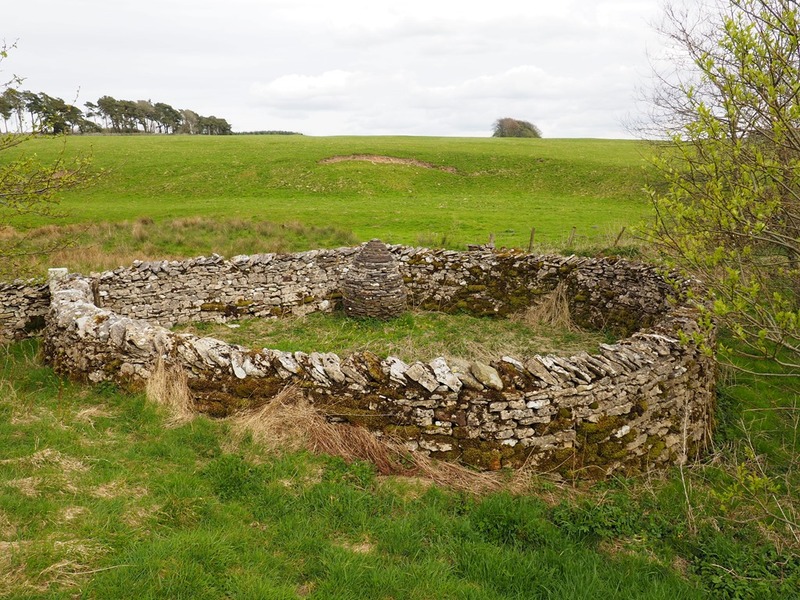 In it we learn that it was an existing, ruined structure that Goldsworthy rebuilt over a period of two weeks in May 1996 using stone from a redundant wall from a nearby farm. 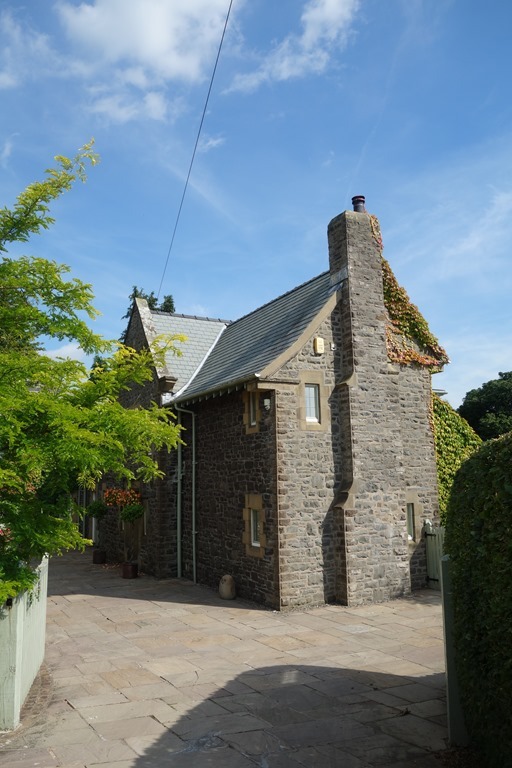 The cone took three days to construct, using limestone and sandstone from local sources. 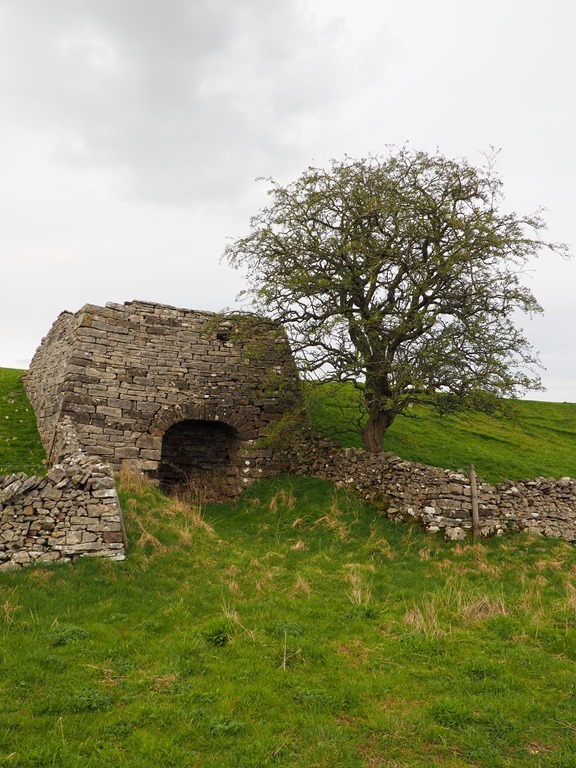 A short distance down the road, next to a disused quarry, there’s another interesting stone structure – an old lime kiln – a fairly intact relic of a bygone age. 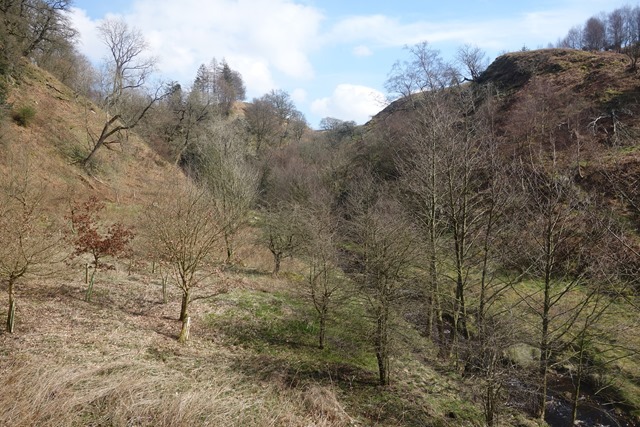 There are 23 small quarries and 20 lime kilns recorded in the local area. 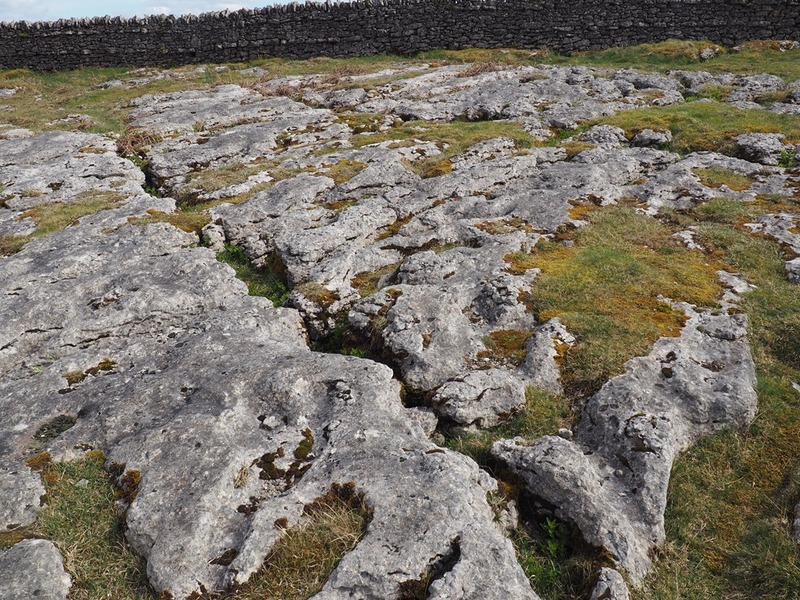 Most of these were used over the course of the last 500 years for processing lime for agricultural and domestic use. 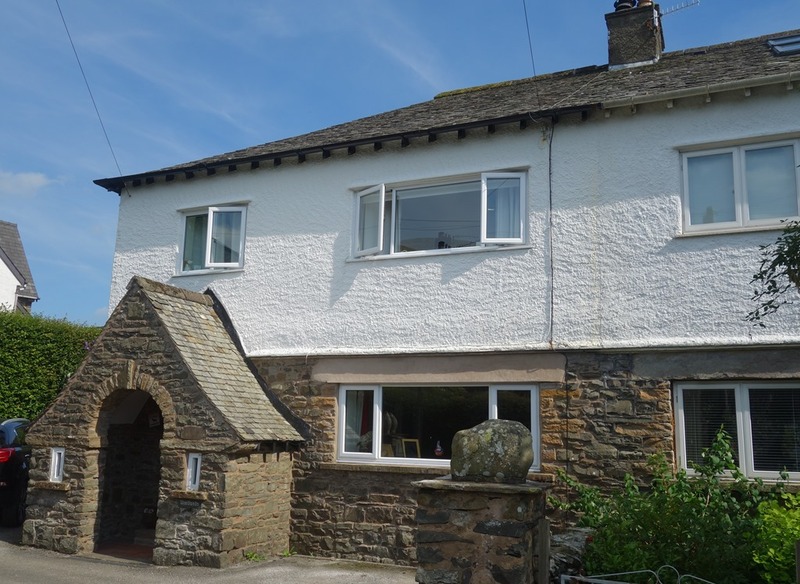 The limestone, calcium carbonate, was “burnt” in the kilns to form “quick lime” (calcium oxide) which was then used in mortar, to render stonework and decorate walls (“whitewash”), to improve the fertility of acidic soils and to improve land drainage. 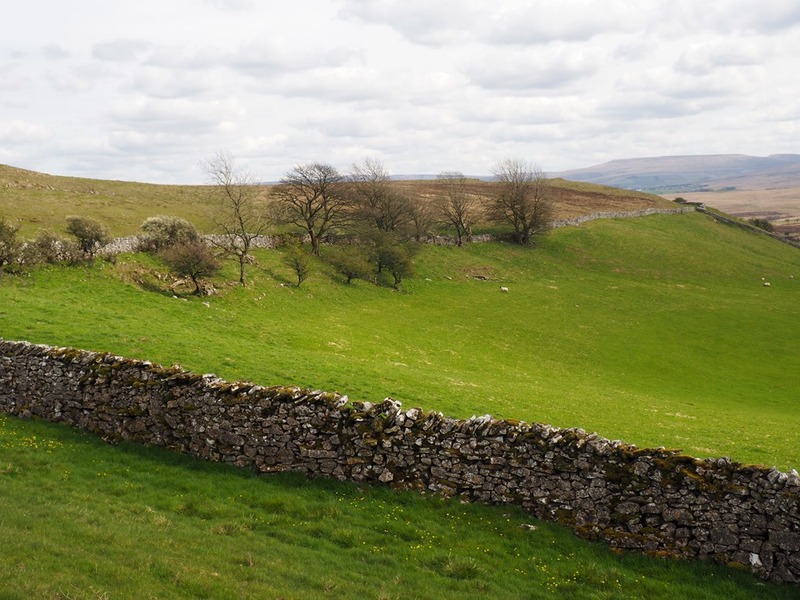 Looking at the project website, there’s a number of other Goldsworthy sheepfolds in the area around Tebay and Kirkby Stephen. Another reason to revisit the area. 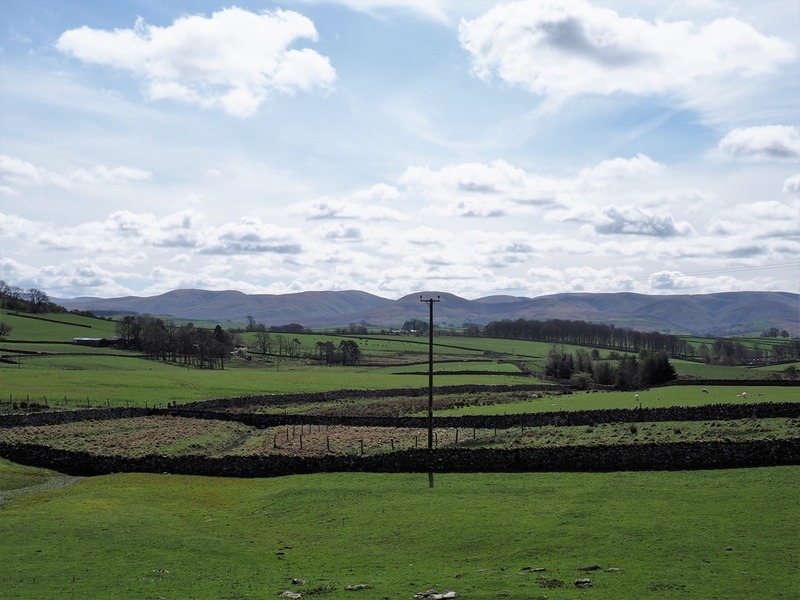 The day after the long Easter weekend I took an extra day off work and we headed up the M6 to Tebay where we turned off the motorway and after a short drive arrived at the small village of Orton. 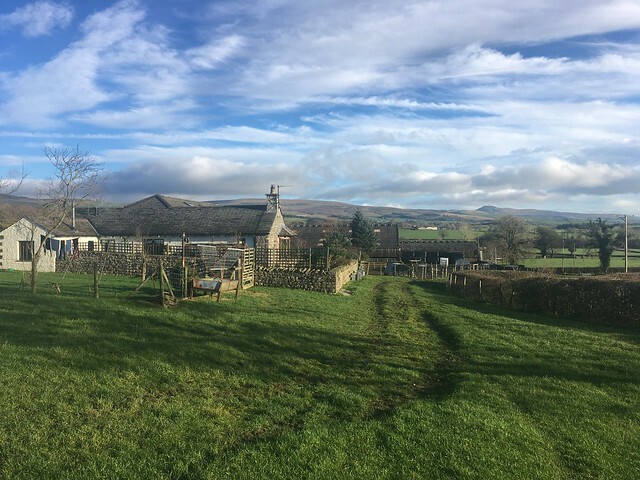 It’s in Cumbria but last year the attractive village and the surrounding area to the north of the Howgill Fells was included in the Yorkshire Dales National Park when the boundaries were extended. 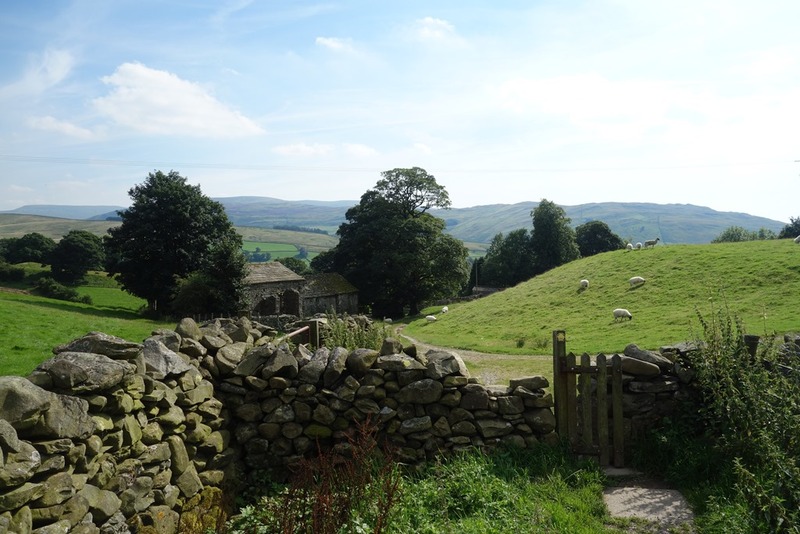 It’s not a well known area and so not crowded with tourists, but the countryside is very beautiful and extremely peaceful. 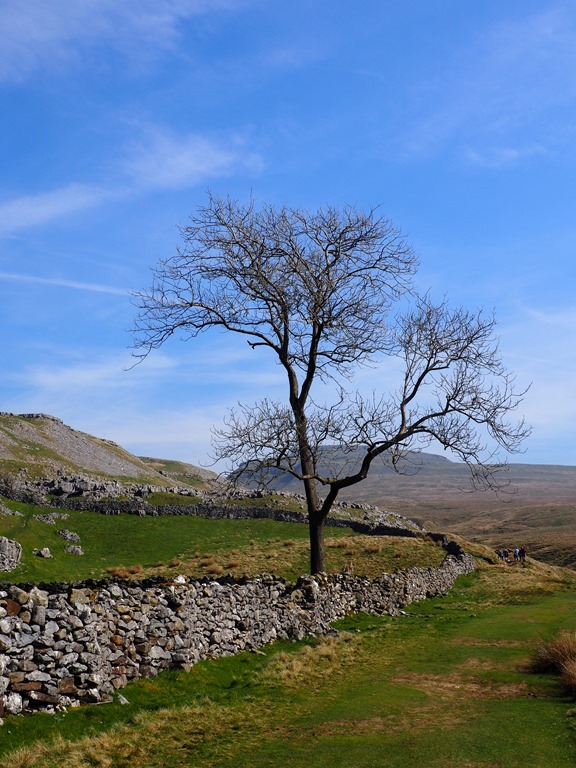 Hard to believe it’s only a few miles from the busy M6. 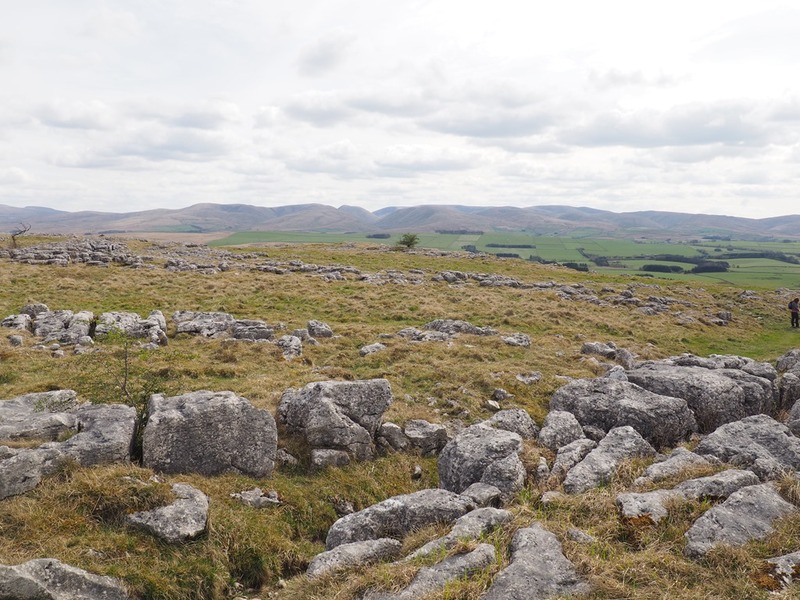 I’d read a few blogs with reports of walks in the area so we decided on a route based on some of these which would take us past and through some extensive limestone pavements around Great Asby Scar. 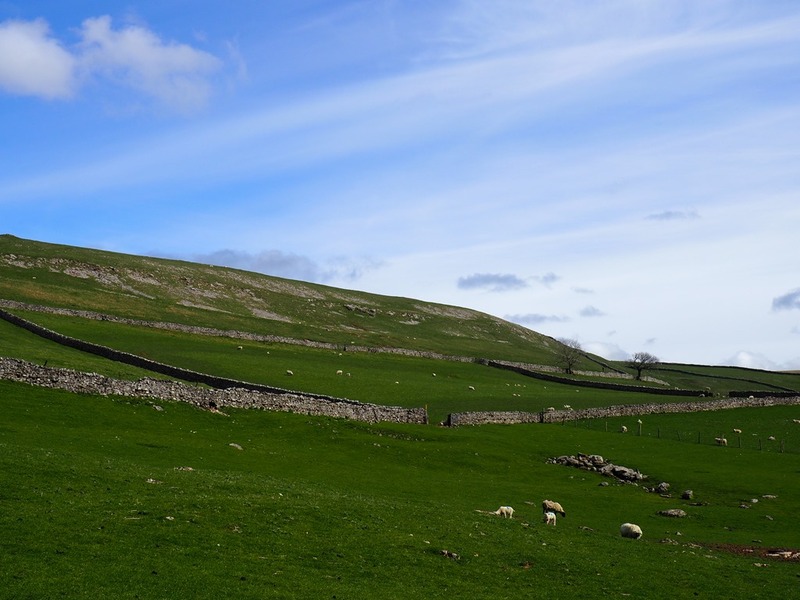 with distinctive limestone rock formations, drystone walls and plenty of sheep. 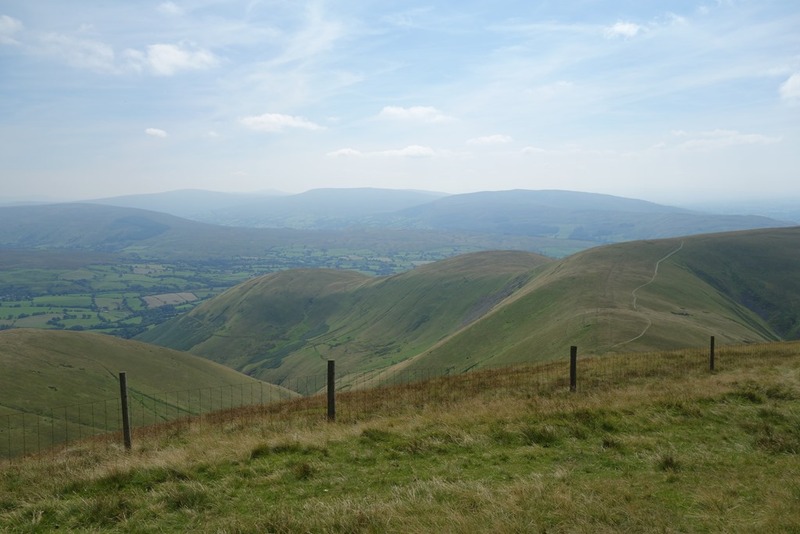 As we started to climb, there was a good view of the Howgill Fells to the south. 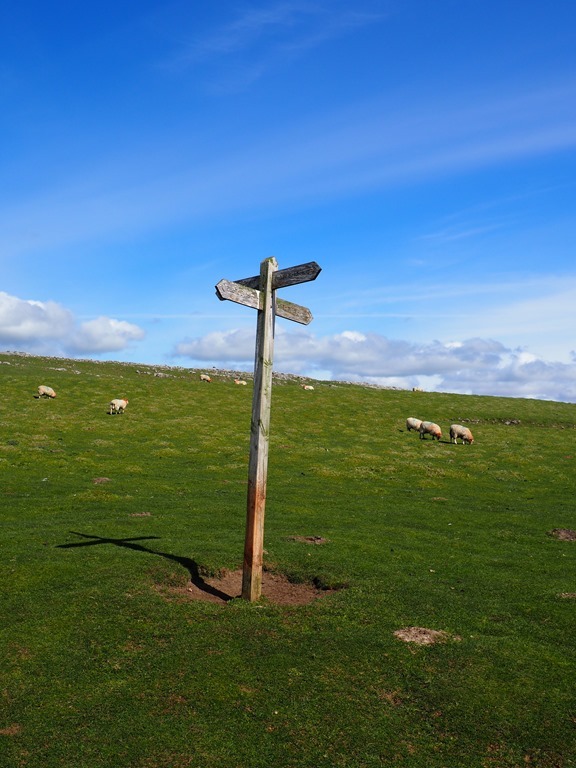 After a couple of miles we reached a crossroads. 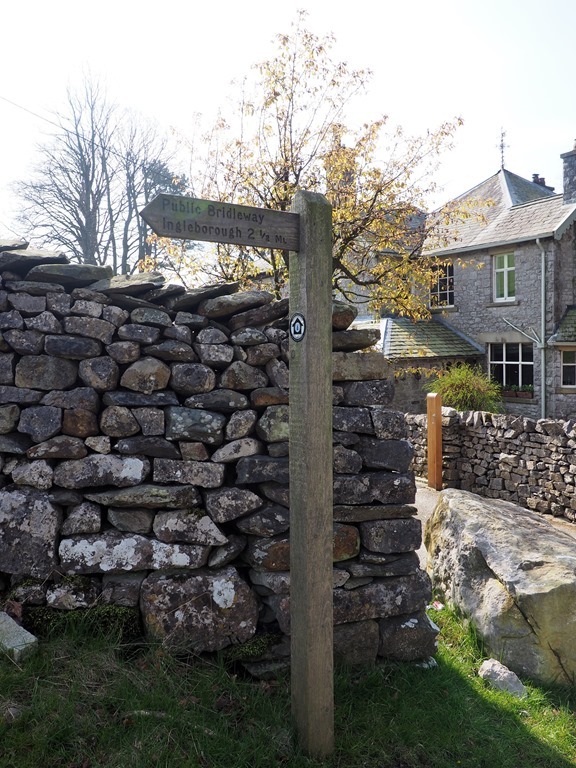 Our route would take us straight on but one arm of the sign posts pointed towards the monument up on Beacon Hill above Orton Scar. We decided to go and have a look. 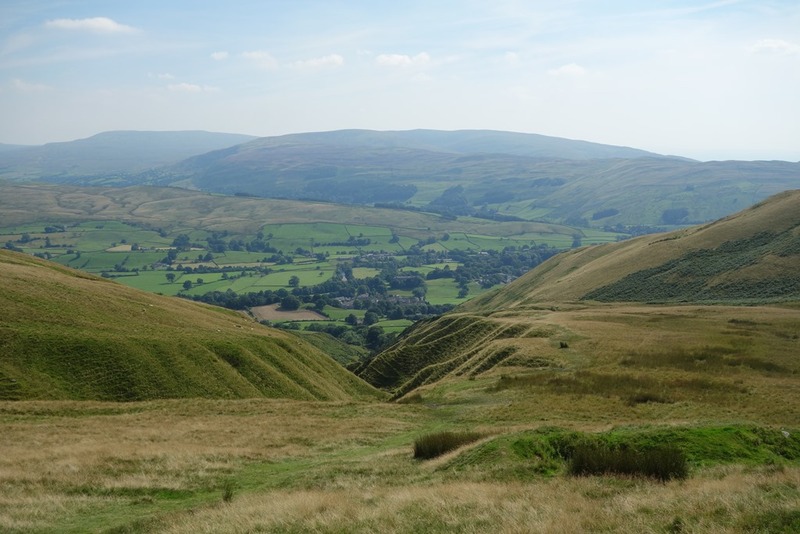 It was worth taking the short diversion as the views in every direction were outstanding. We headed back down the hill to rejoin our planned route. 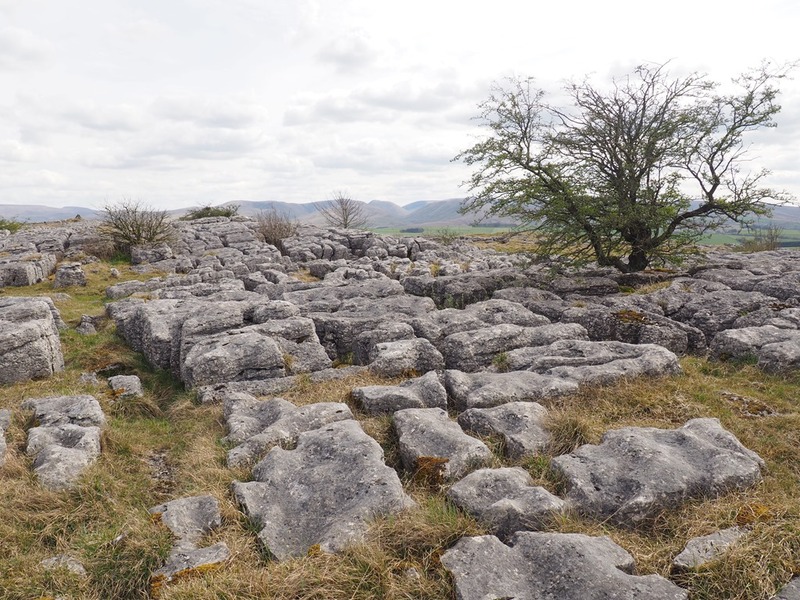 Great Asby Scar has one of the most extensive areas of limestone pavement in England and a section of it has been designated as a National Nature Reserve. 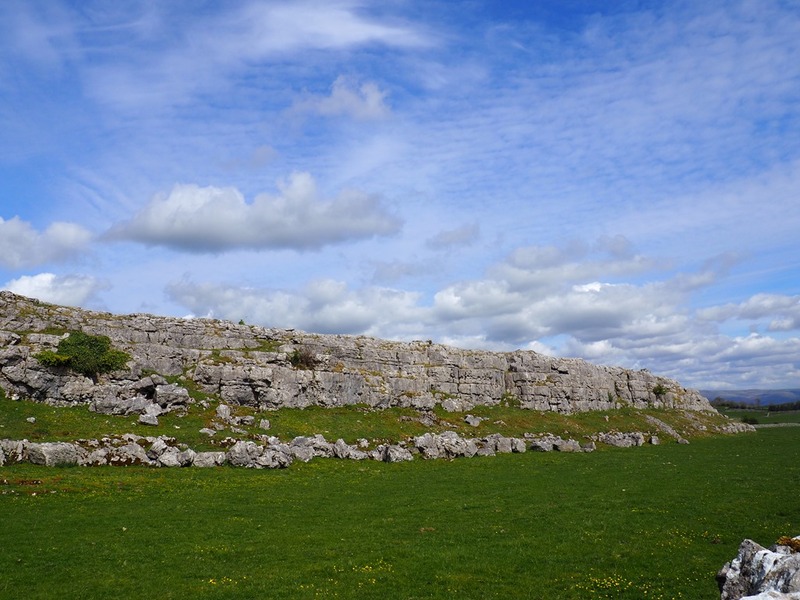 There was a heavily fortified Romano-British site – the Castle Folds Settlement – on top of one of the limestone scars. 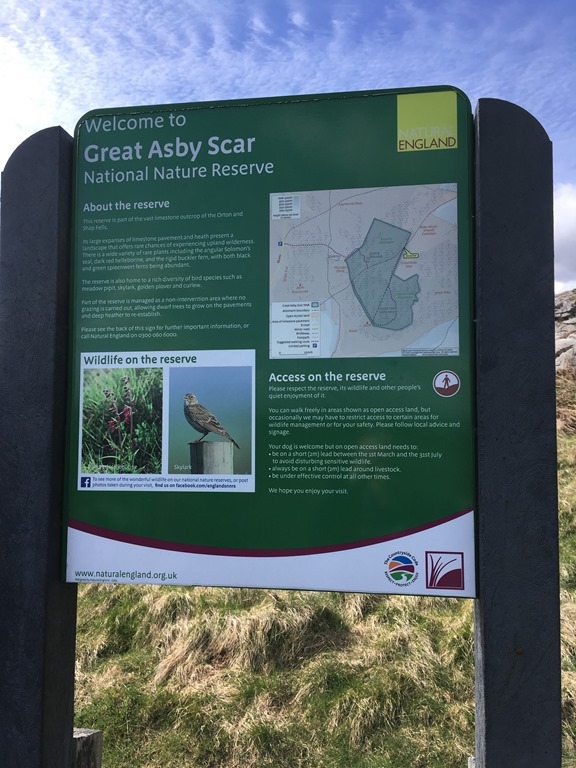 It’s possible to walk over the open access land on the Reserve to look at the site, but we decided to stick to the route we’d planned. 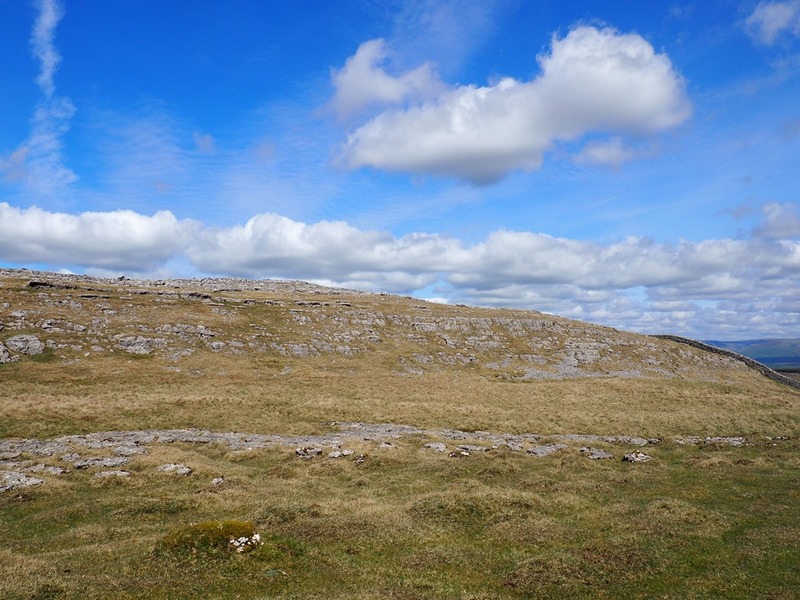 But I think it would be worth another visit to the area to walk over the limestone pavement to take a look at the site. 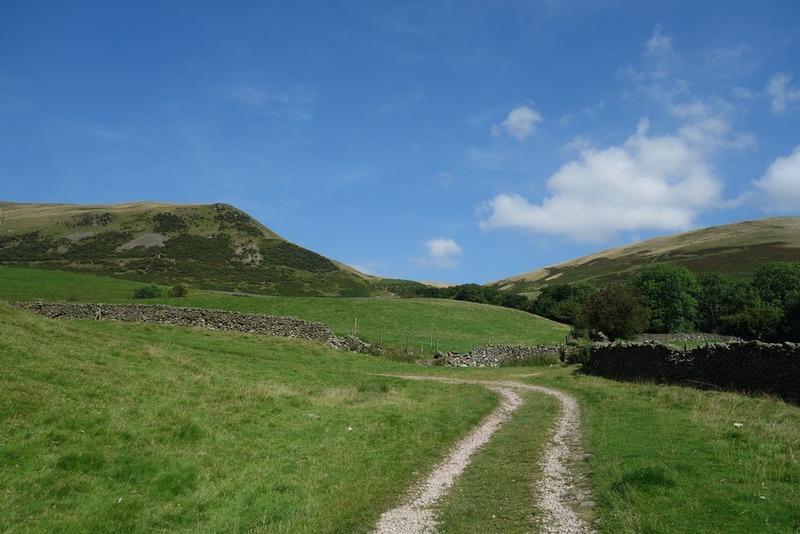 We carried on along the bridlepath. 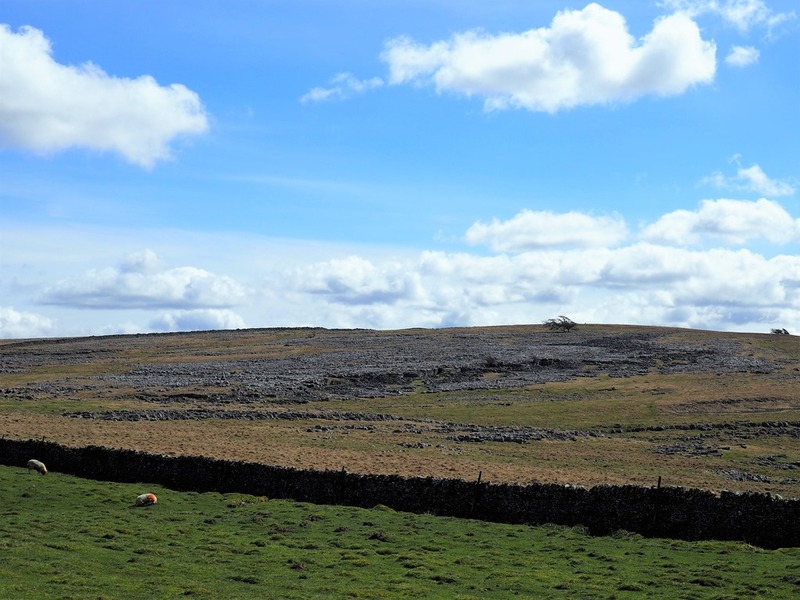 A short distance before Great Asby village we too a path south west across some fiels and then picked up the path heading south west which would take us back towards Orton across some more limestone pavement. 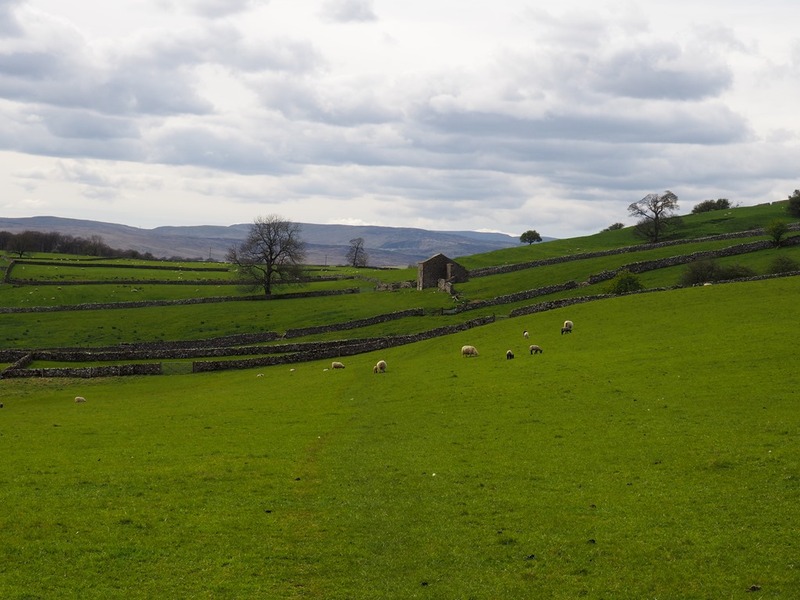 We descended into pastoral countryside, the fields fresh and green. 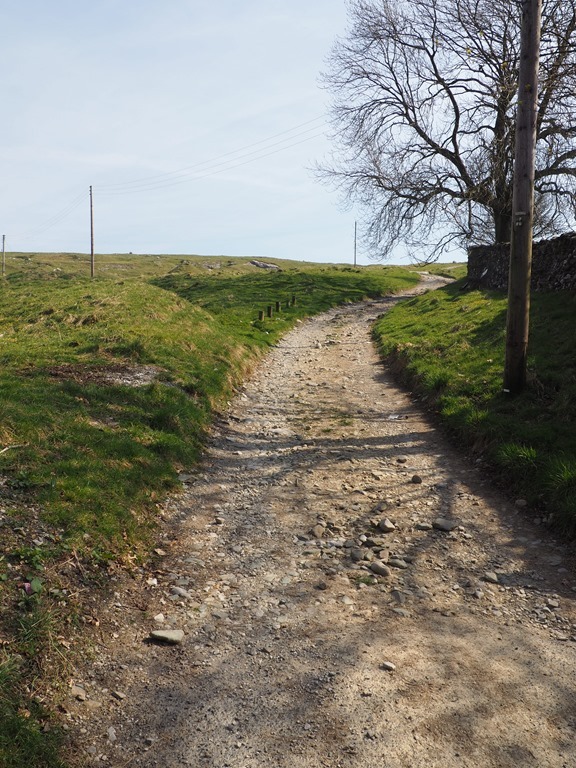 We reached the road at Sunbiggin and walked along the tarmac a short distance before joining a path that took us back over the fields. 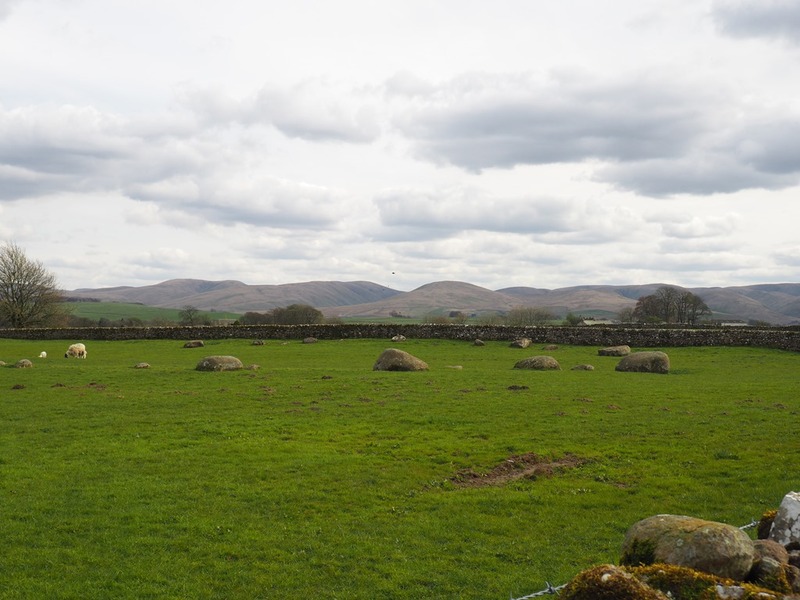 A mile or so before Orton we passed the Gamelands stone circle in an adjacent field. 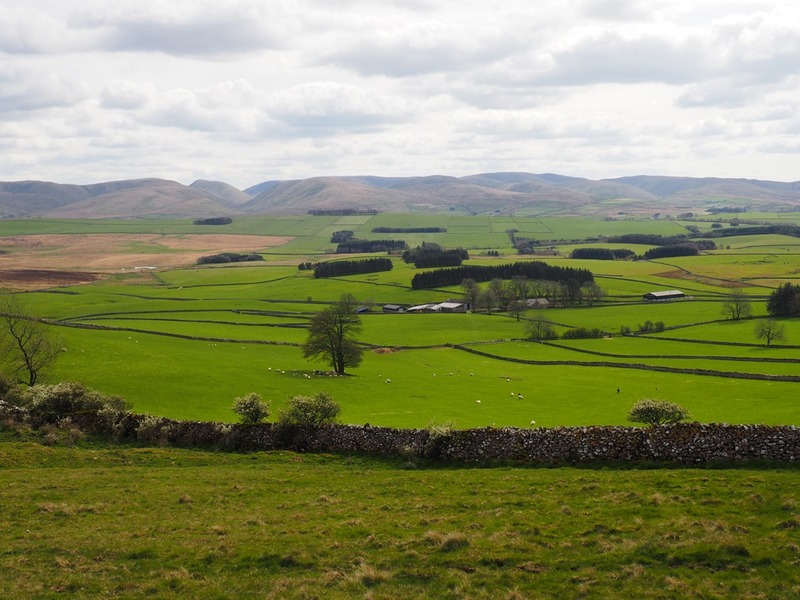 It’s one of the largest circles in Cumbria. 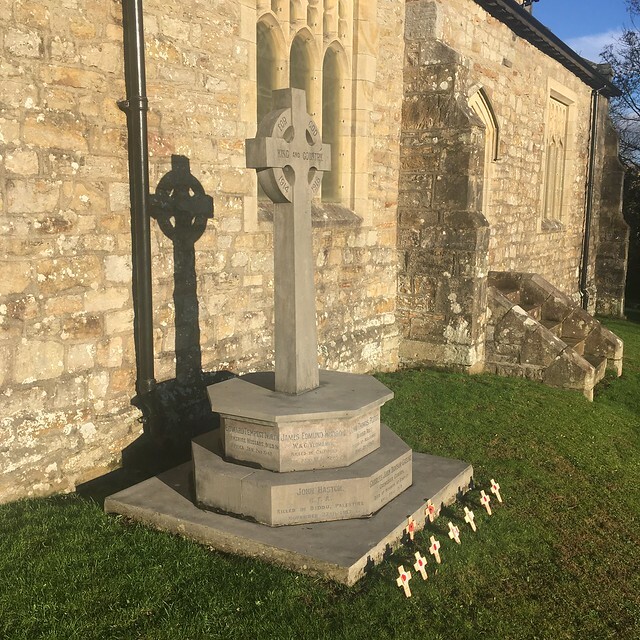 Unfortunately the stones have all been knocked over and some have been removed. 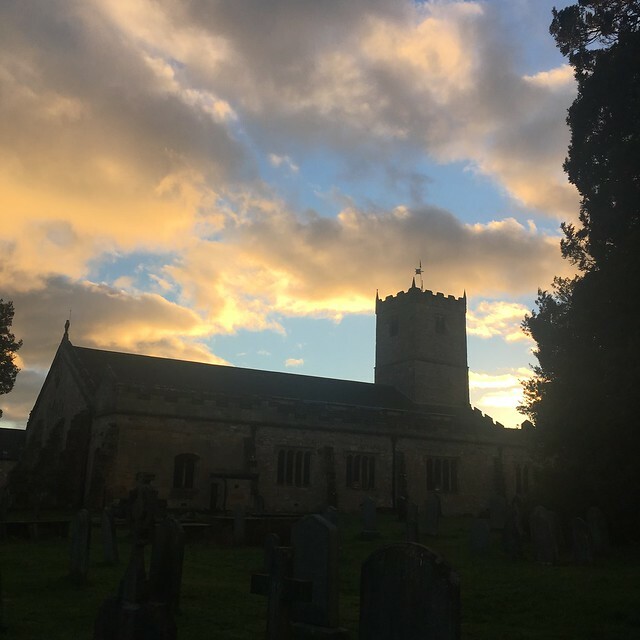 We’d timed our walk to perfection – they stopped serving a little while after we arrived. Now that would have been disappointing. Sunday morning the sun was shining. 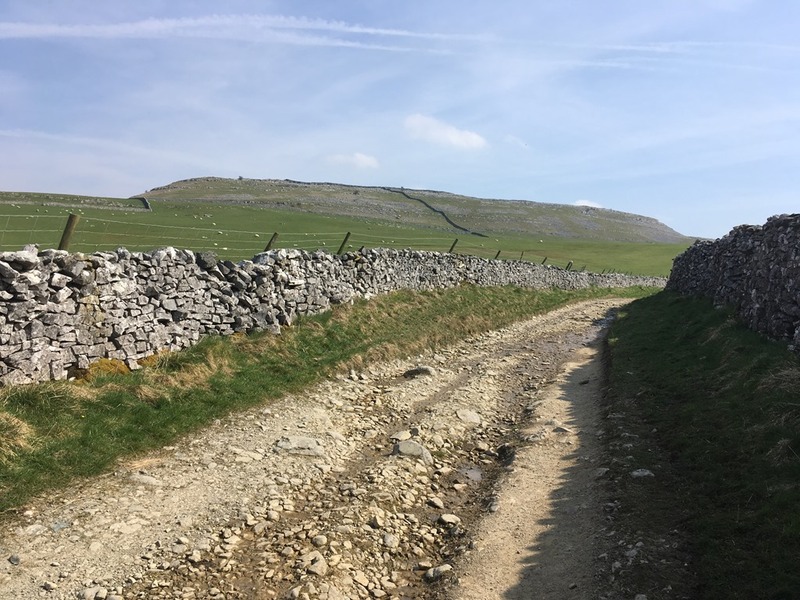 We got up early, loaded our boots and rucksacks in the car and drove over to Ingleton in the Yorkshire Dales, which is less than an hour and a half away (traffic willing), to climb Ingleborough. 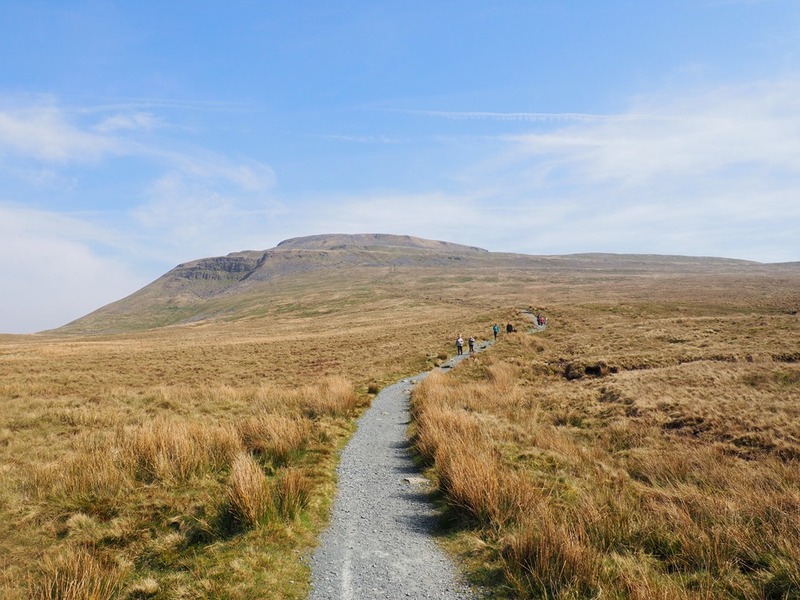 The mountain is one of the one of the “Yorkshire Three Peaks” and as we’d climbed Pen-y-ghent a couple of years ago we’d be able to tick off our second of the three. 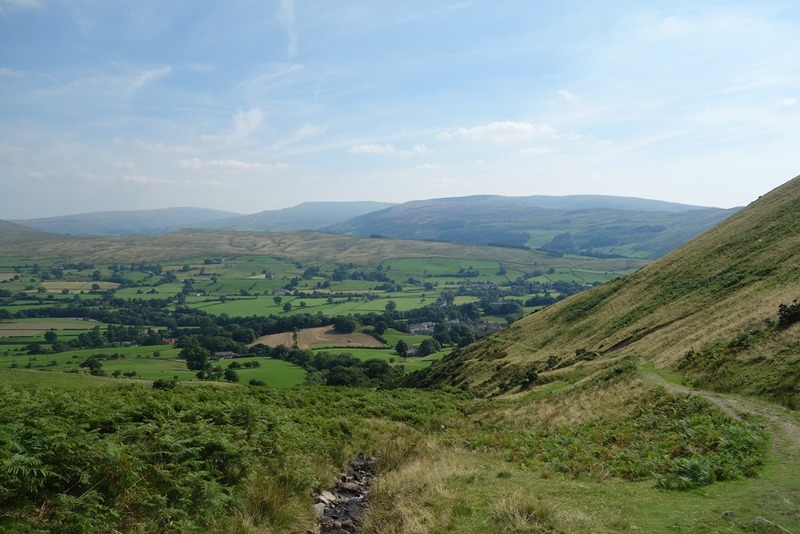 There were good views over to Whernside, the third of the “Three Peaks” but visibility wasn’t as good as the previous week when we’d walked up Clougha Pike, over the border in Lancashire. 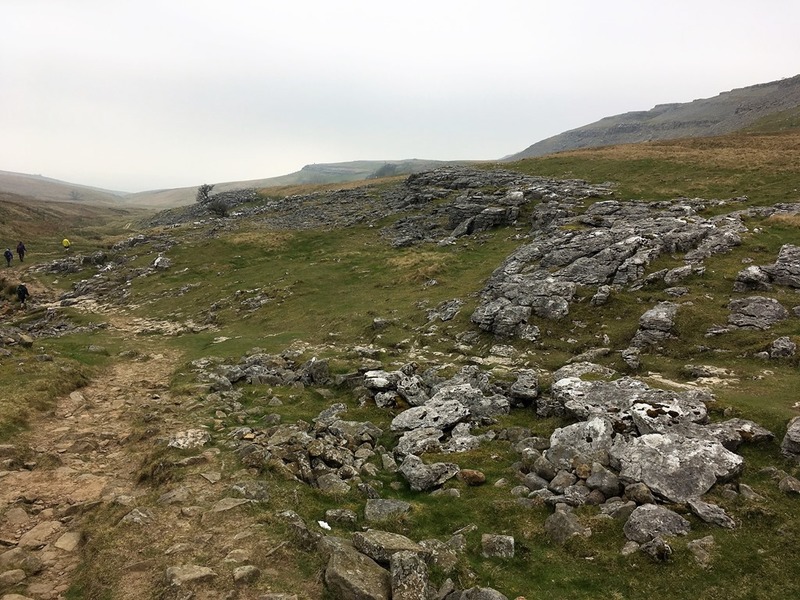 The route involved a gradual ascent over a couple of miles along a well defined path followed by a short steep climb of the cliffs up to the gritstone cap at the end to reach the summit. 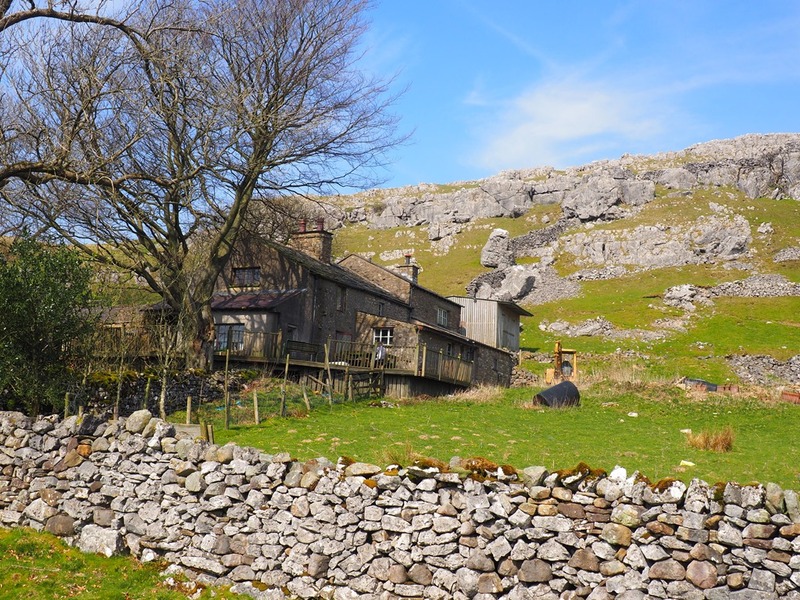 About half way along the route we passed this isolated farmhouse – “the Little house on the Prairie”? 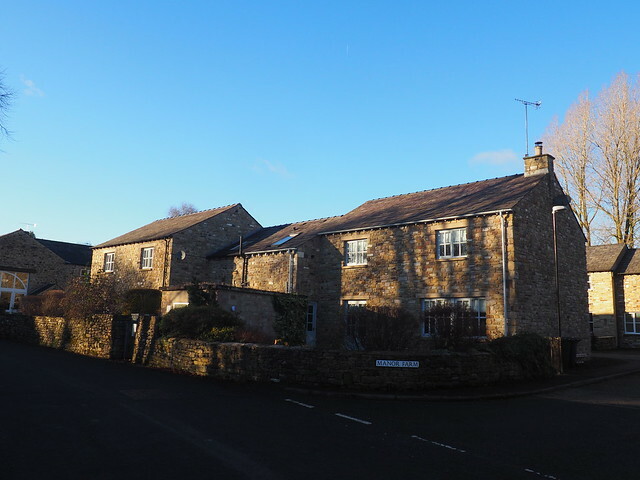 It looked nice in the sunshine but it would be a very bleak setting for much of the year. 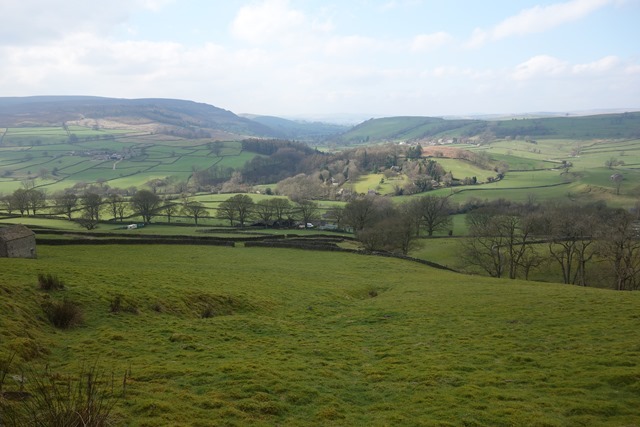 As we were walking along the valley, looking back we could see cloud coming in from the north west and there was a strong breeze behind us. 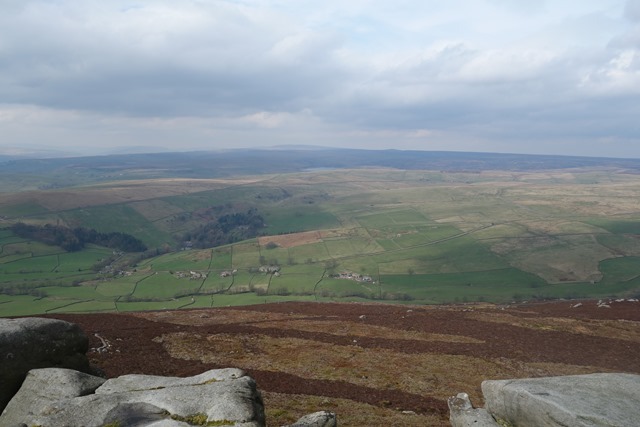 The wind became fiercer as we climbed the final steep section up the millstone grit cap that gives the mountain it’s distinctive shape. 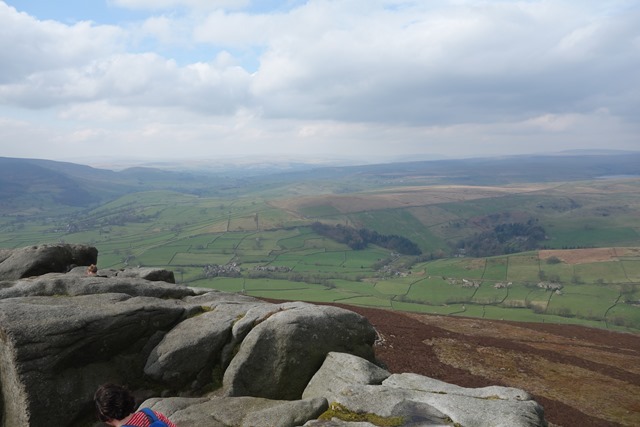 Luckily we’re reasonably sensible and had come prepared with jumpers, gloves and coats in our day sacks. It was time to put them on. Yet we passed quite a few people ill-equipped wearing t-shirts, flimsy tops and dresses and completely inadequate footwear. 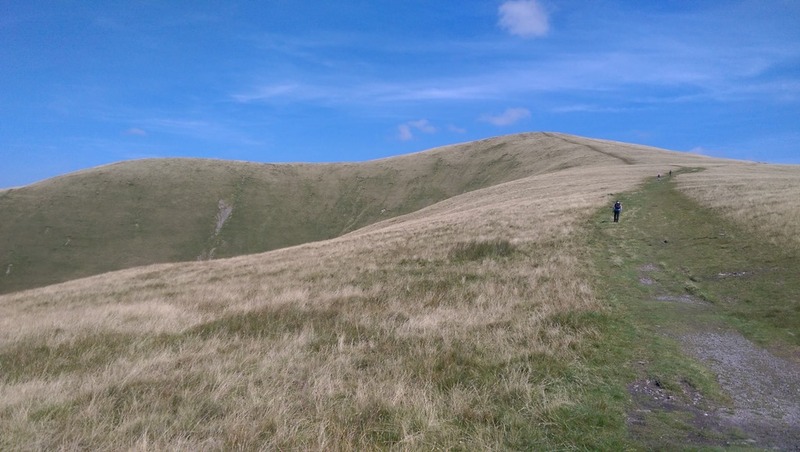 As a popular mountain in a National Park it attracts a lot of day trippers who setting out on a bright, warm, sunny day don’t realise just how quickly conditions can change. 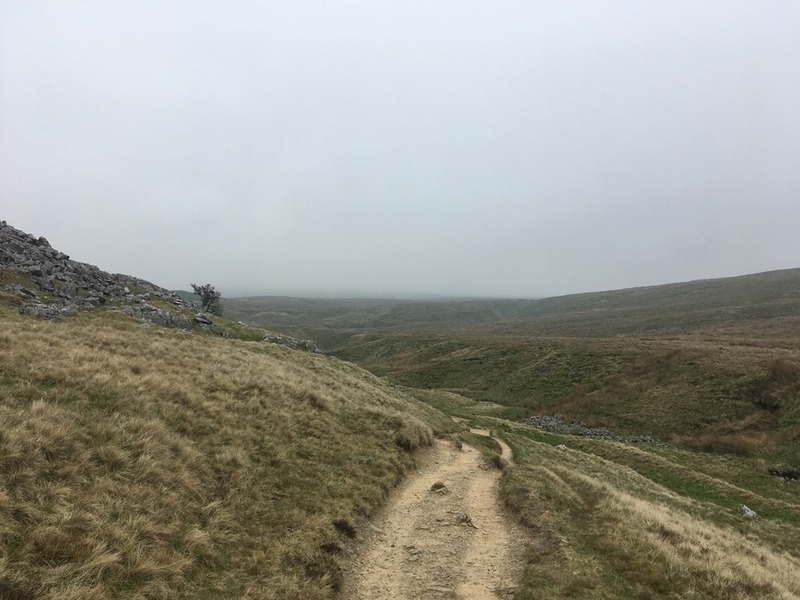 As we climbed, the cloud had come in, engulfing the summit at almost the same time as we reached the top and the wind was blowing strongly enough to knock the unwary off their feet. 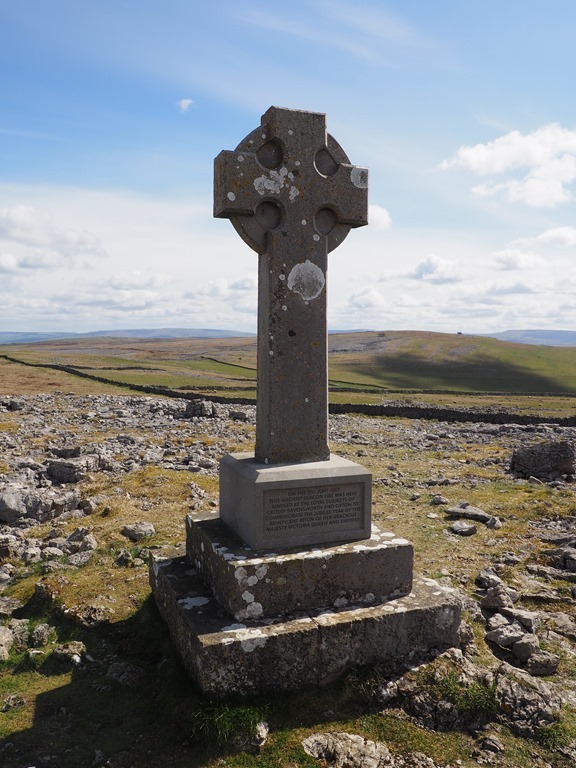 Despite being a “peak” the summit is a flat plateau which, on a good day, has extensive views over the Dales and to Pen-y-ghent and Whernside. We managed to find a seat inside the wind shelter to take a rest, a drink and a bite to eat. 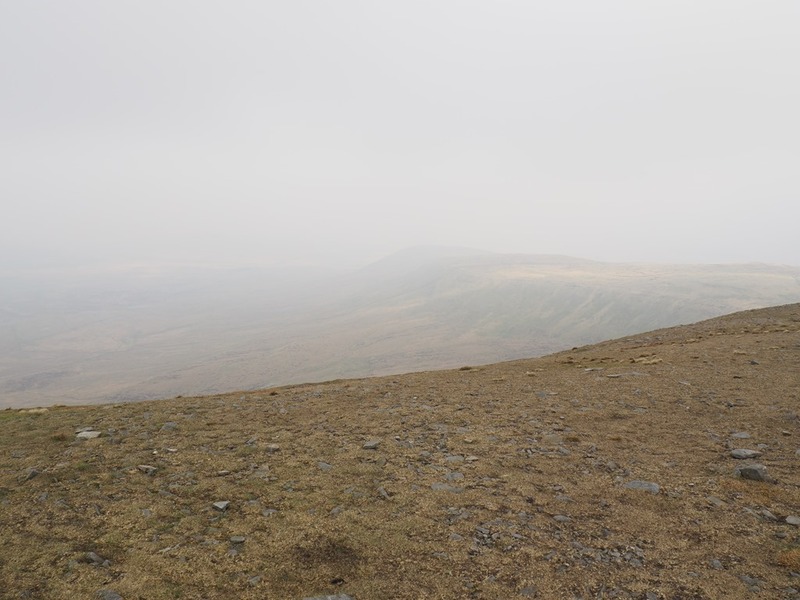 And we chatted with some other walkers, some of whom were attempting the Three Peaks Challenge. Not for us though, one peak was enough for today! We set back down retracing our route. 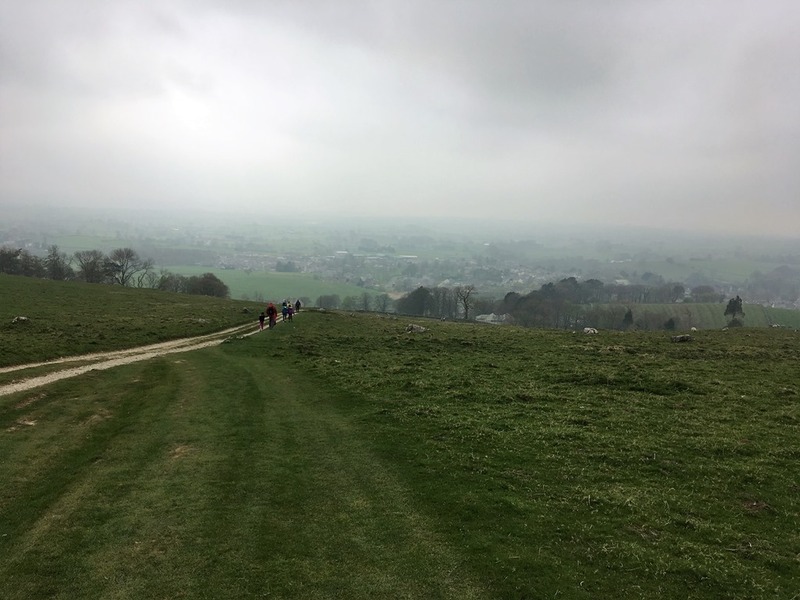 A circular walk is possible but it would have meant either finishing with a long stretch on tarmac, which didn’t appeal, or navigating along unfamiliar territory without clear paths and we didn’t want to risk that in misty conditions. Looking back the mountain had disappeared! 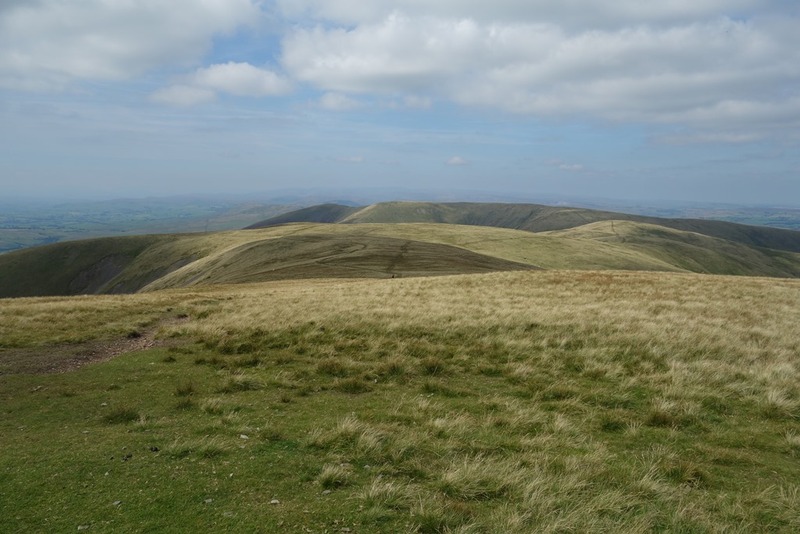 So our second of the “Three Peaks” conquered. 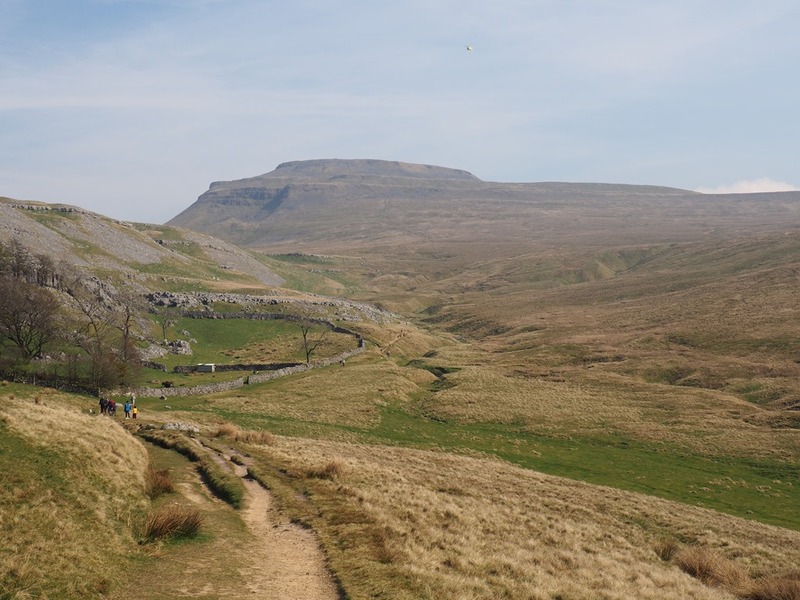 Whernside next! 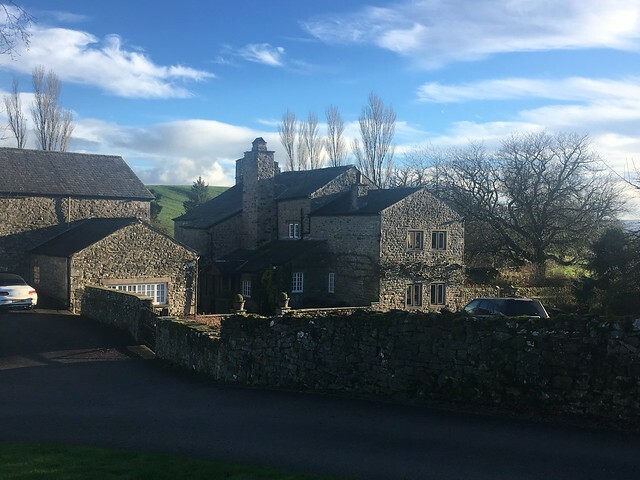 We arrived back in Sedbergh after our walk up to the Calf just before 4 o’clock ready for a refreshing brew (and, possibly a cake!). 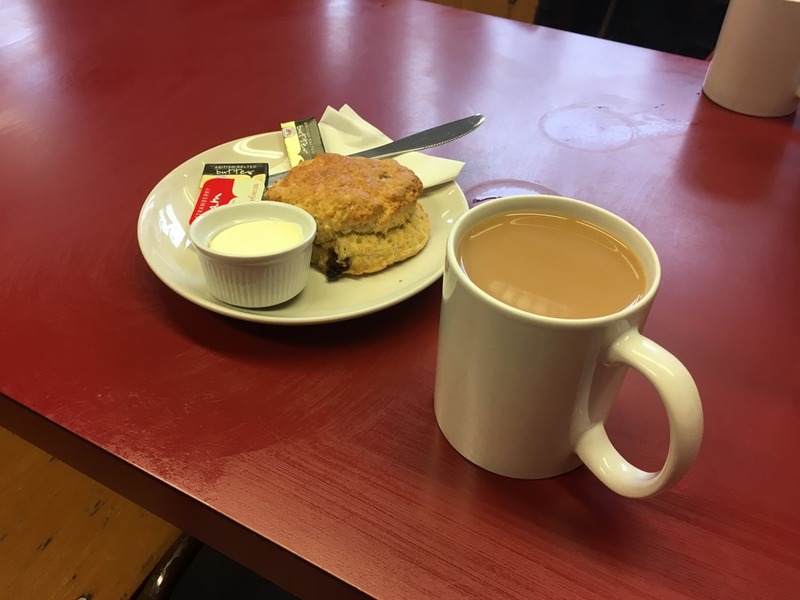 While we were loading our rucksacks into the boot of the car a couple of coaches drove into the car park.. We’d better be quick, I thought, or we’ll not get in the cafés if we have to compete with 80 so day trippers. We found a small café in the main street. The Three Hares turned out to be a good choice. 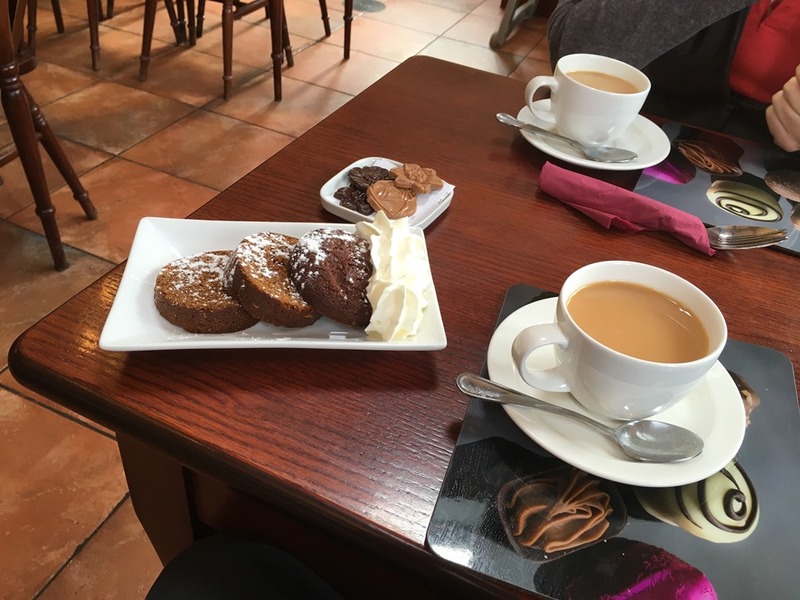 It was very pleasant, a little quirky and the tea and cakes were very good – and good value – I queried the bill as I thought they’d undercharged us, but they hadn’t. 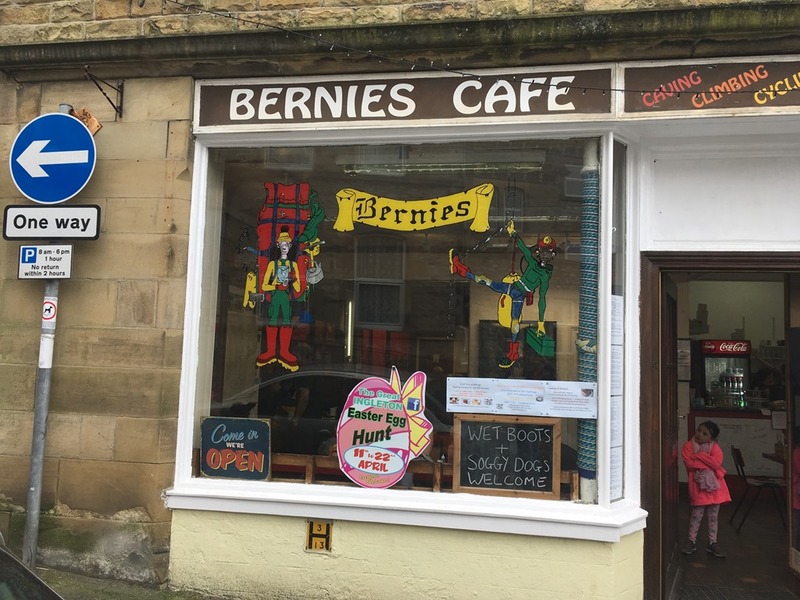 Their lunch menu looked interesting and they serve evening meals on Friday and Saturdays with a changeable, imaginative menu. Worth a try if we’re down that way over the weekend I think. It was a good job we got there quickly as there weren’t many tables and those that were free after we had placed our order soon filled up. After that there was a procession of people trying to find a seat or looking in the window and walking past. We found out later that it was the only café open in the town. There were others, but they were all shut. At least one of them only being open 3 days a week. 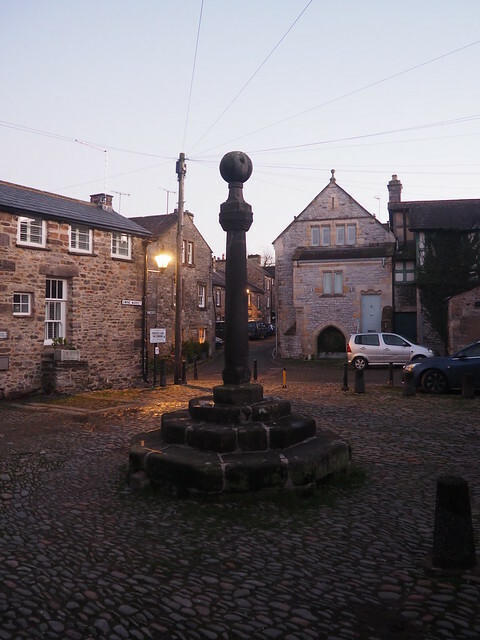 After finishing our brew we went for a wander around the small town. There were a number of interesting looking shops but they were all shutting up. They all seemed to only open at 10 and shut at 4:30. 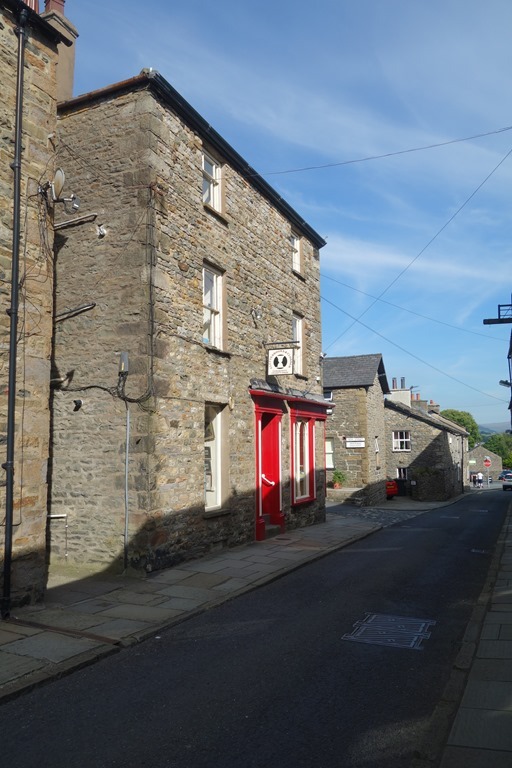 Even the tourist office shut at 4. There were a lot of disappointed looking day trippers wandering around the streets and sitting on benches waiting for time to leave! It was a good job it wasn’t raining. 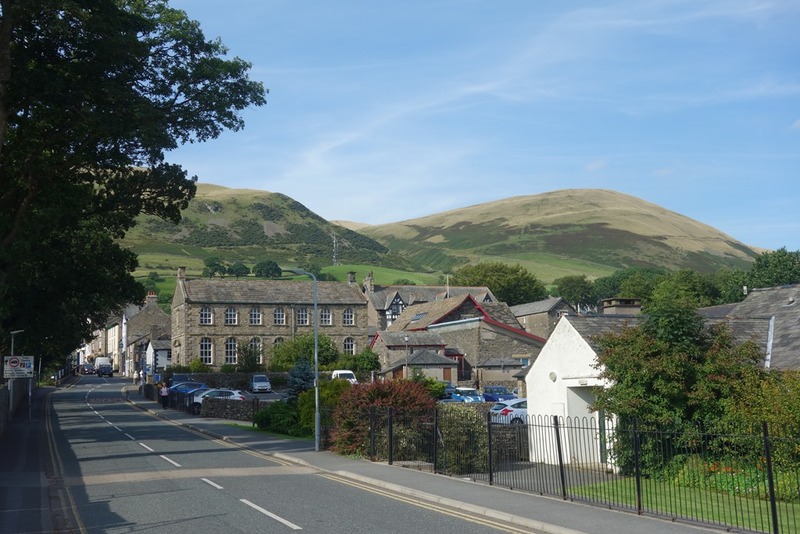 Although today Sedbergh, which is only a few miles from Kendal, is in Cumbria, until 1974 it was in the West Riding of Yorkshire. 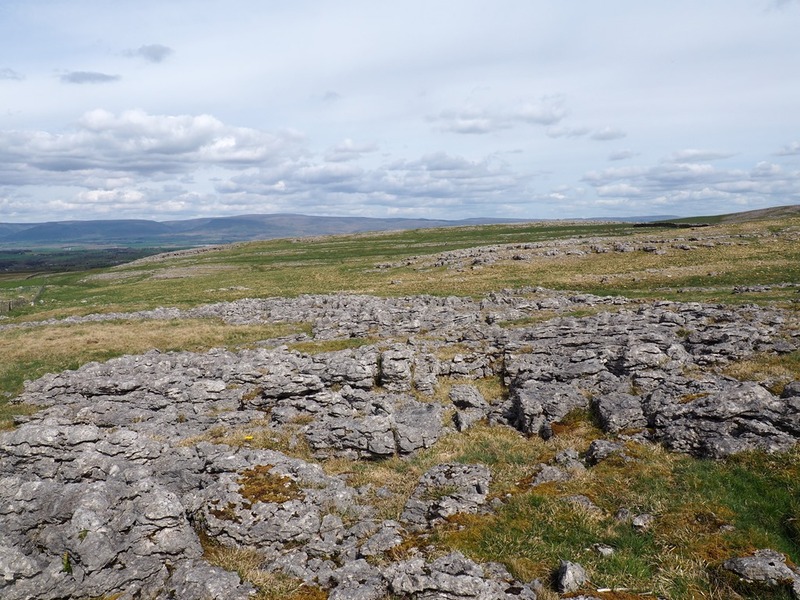 That explains why it is within the Yorkshire Dales National Park. Historically, other than agriculture, the main industry was the production of woollen garments. 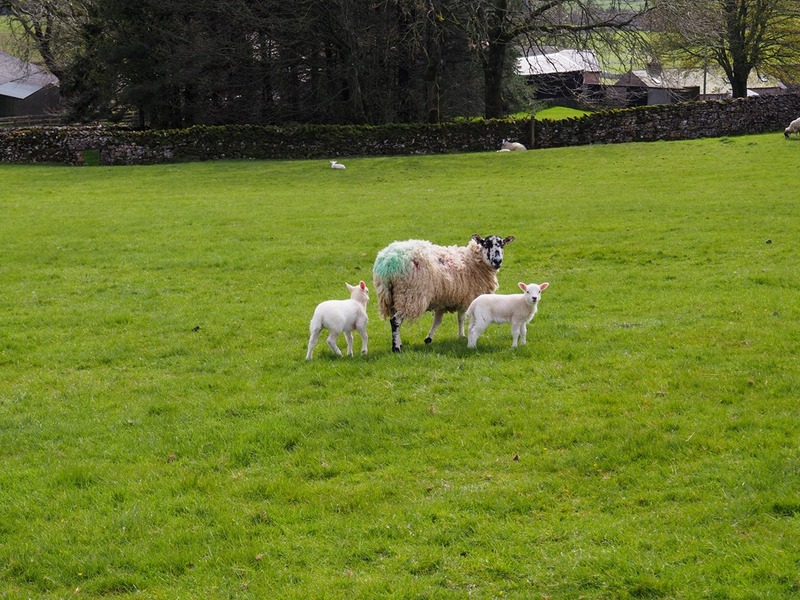 Knitted clothing, including hats and socks was produced in workers’ own homes from yarn produced in nearby woollen mills, and then were sold on by local merchants . That industry is long gone. 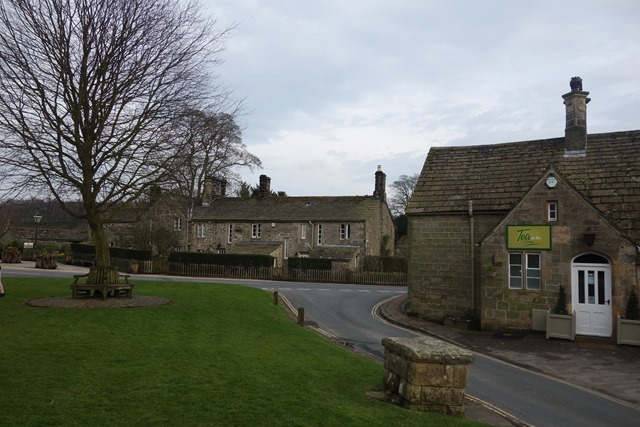 Today, the main employer is the public school which dominates the south end of the village. It’s a small town which very much feels that it’s been left behind by the 21st Century. We were able to walk around almost all of it in about 20 minutes. 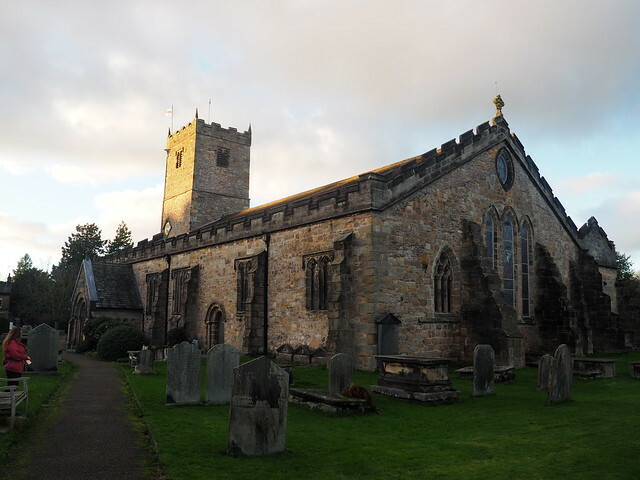 The parish church dedicated to St Andrew dates from the 12th century, although, like many old churches it has been restored over the years. 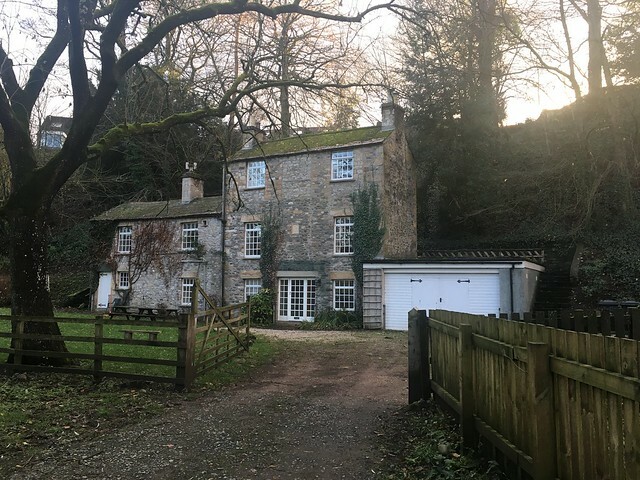 We didn’t have chance to have a look inside. 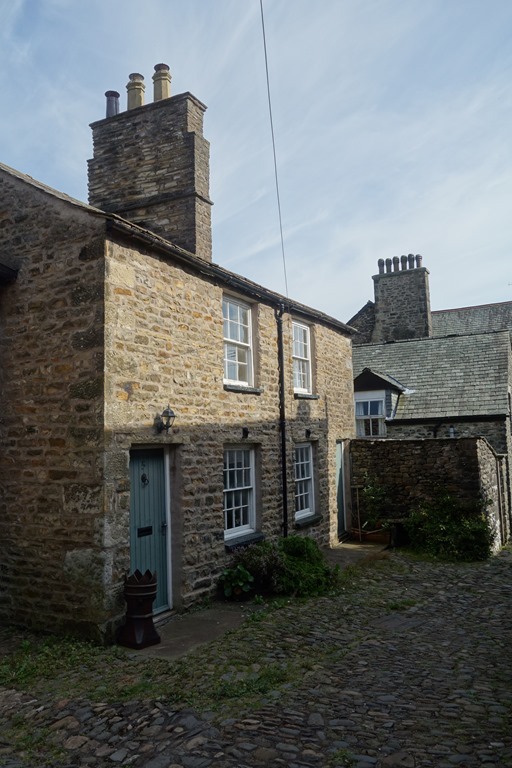 The buildings were predominantly stone cottages, many of them clearly quite old. 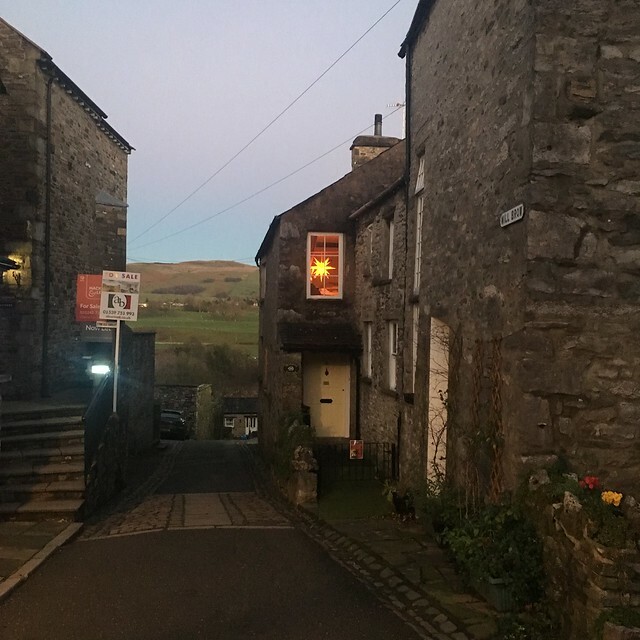 Like Kendal many of the older dwellings are clustered in “yards” – narrow lanes off the main street, running more or less perpendicular to it. 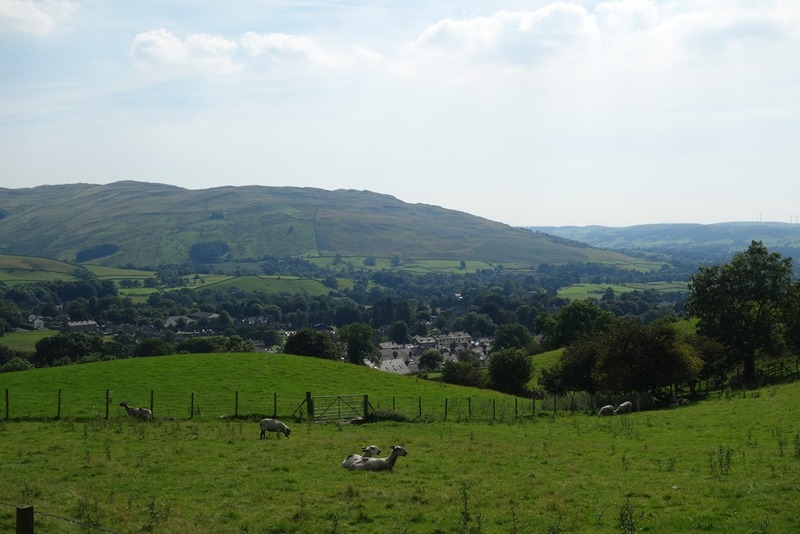 Sedbergh calls itself England’s official Book Town inspired by Hay on Wyre. There are a small number of dedicated book shops, but most other types of shops also had a selection of second hand books on sale. All in all a very pleasant, attractive little town and it would be worth spending some more time there. 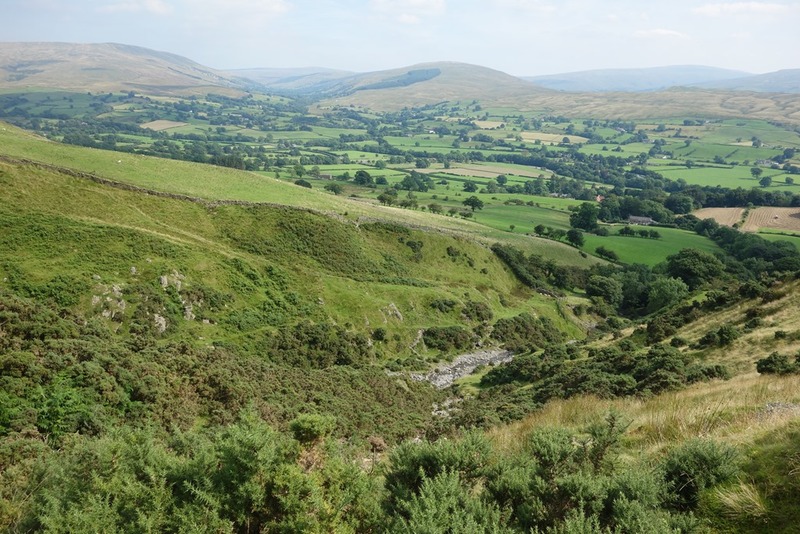 It would be a good base for exploring the area and the fells and hills in the vicinity. 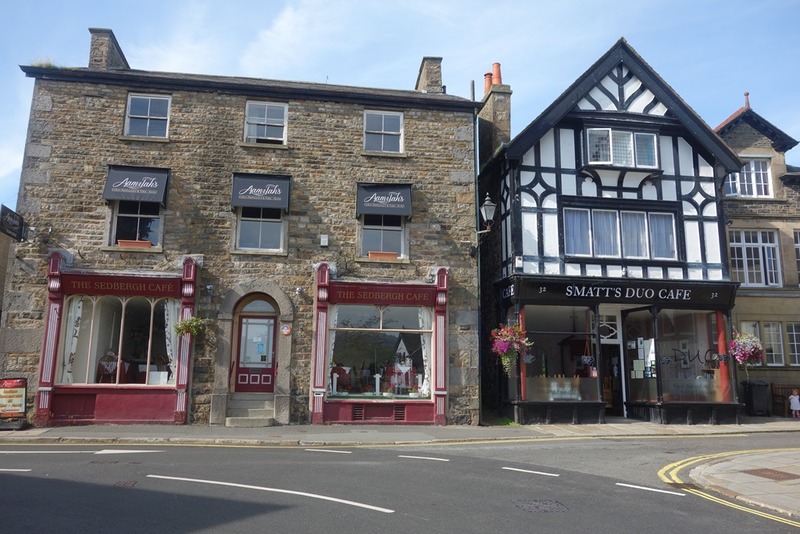 And it would be interesting to have a mooch around the shops – providing we visited after 10 and before 4 or 4:30 on a day when they’re open! 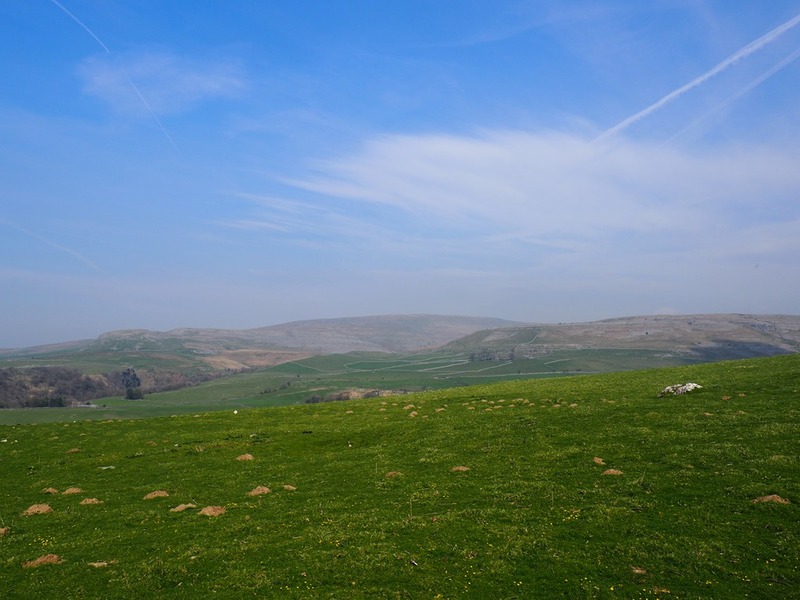 We’ve been treated to a few days of warm, sunny weather this week – a true taste of summer. 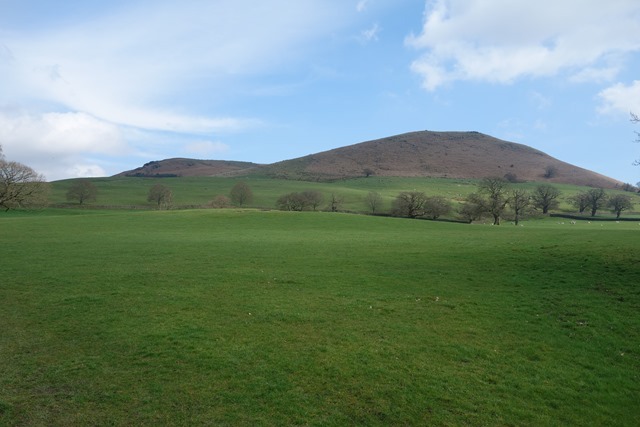 So on Tuesday a decision had to be made – stay in the office stuck behind the computer preparing and revising some course notes or take the day off and get out for a walk. No competition, really. The work wasn’t urgent, it could wait. The hardest decision was where to go. 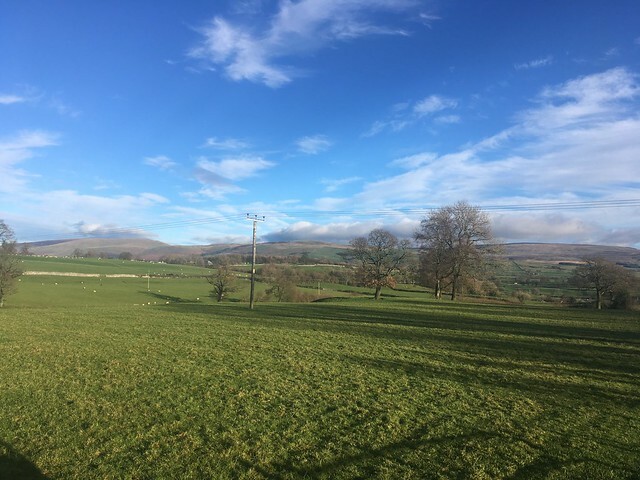 The Lake District beckoned but during the peak holiday period it was likely to be busy, so we decided to go for a walk in an area on the north eastern edge of the Yorkshire Dales, close to the Lake District – the Howgill fells. 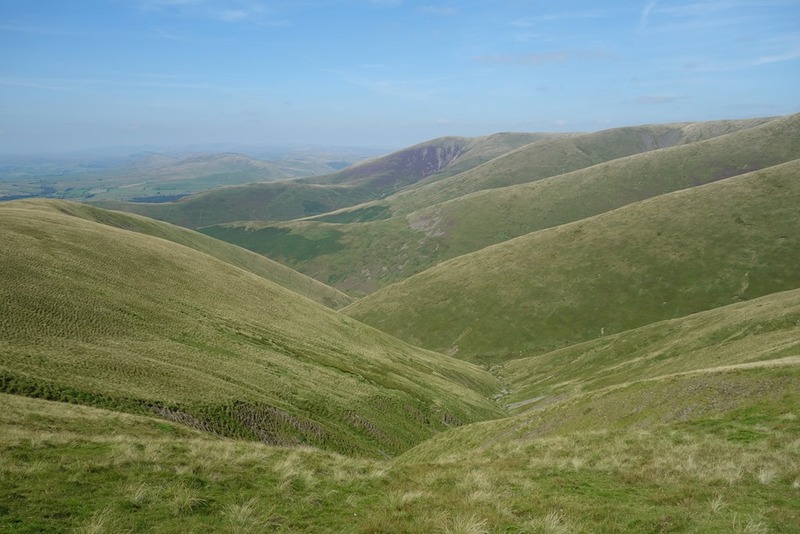 I’ve passed these attractive grassy hills many a time driving up the M6 between Kendal and Carlisle and on the train to Scotland and always felt that I’d like to get up on the fells, so Tuesday was our opportunity. 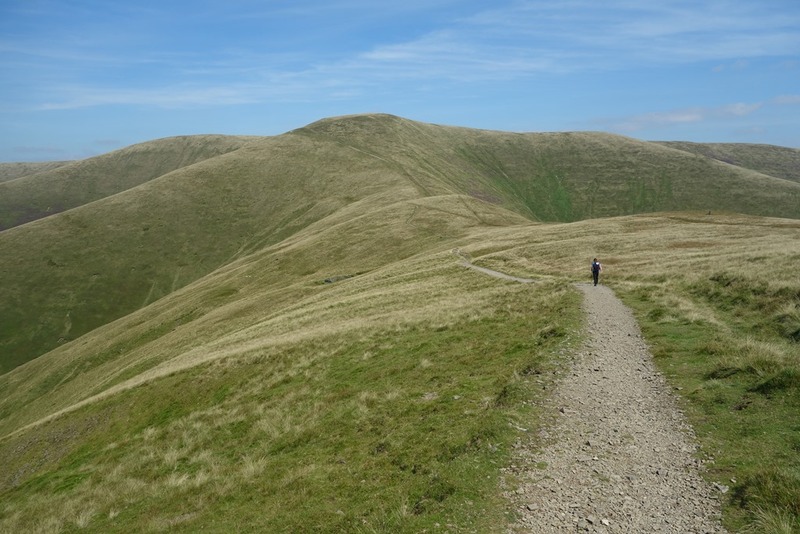 We plumbed for what’s probably the most popular route, from Sedbergh at the southern end of the fells up along the ridge leading to The Calf, the highest point in the Howgills. 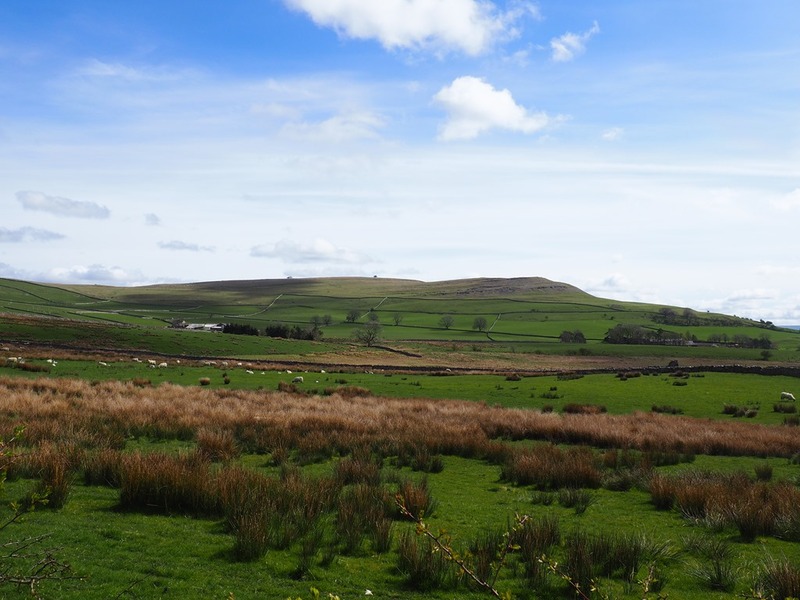 Historically in Yorkshire (along with the southern half of the fells), following local government reorganisation in1974 the small town (a village, really) was transferred to the newly formed county of Cumbria. 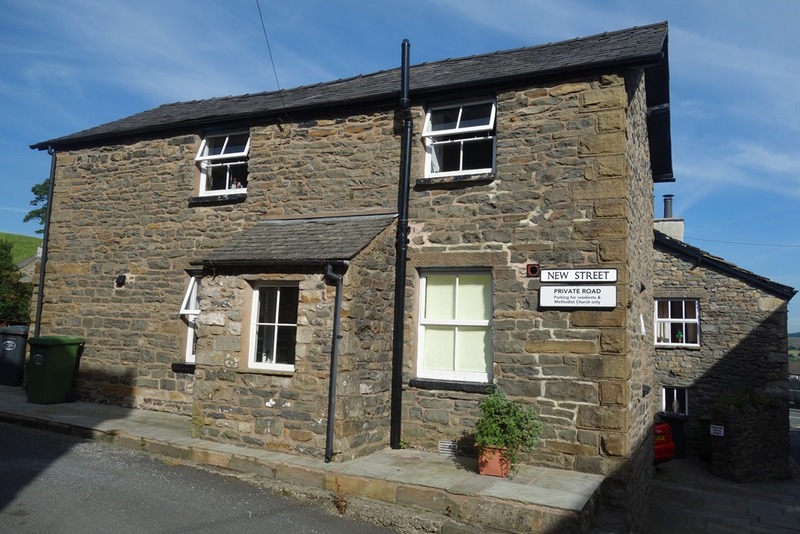 We parked up in the car park in the centre of the village near to the information centre, donned our boots and set off for the fells. 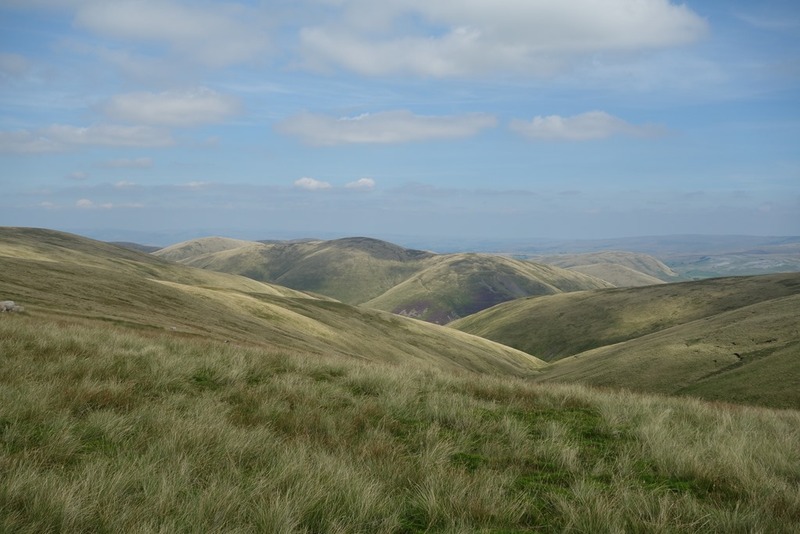 but we were soon up on the grassy fells. 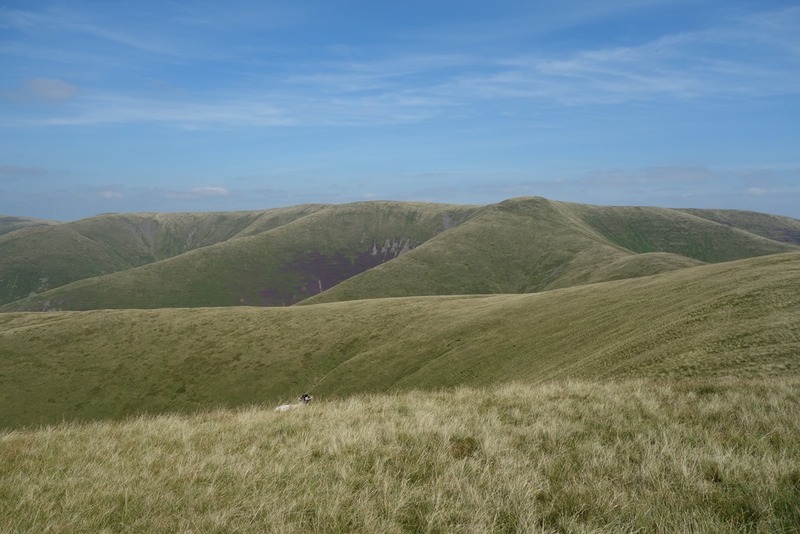 Other than a fence that crosses the range on Calders there are virtually no man made boundaries on the top of the fells which gives a real sense of freedom. 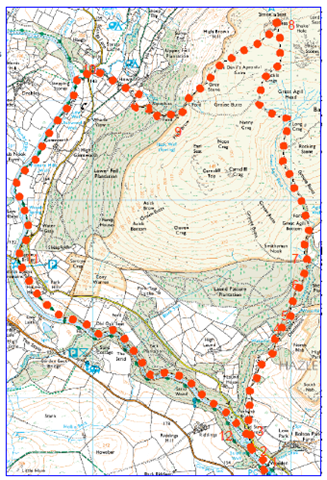 It’s an open access area too, so you’re free to roam and although there are plenty of clear paths many of them aren’t marked on the OS maps. 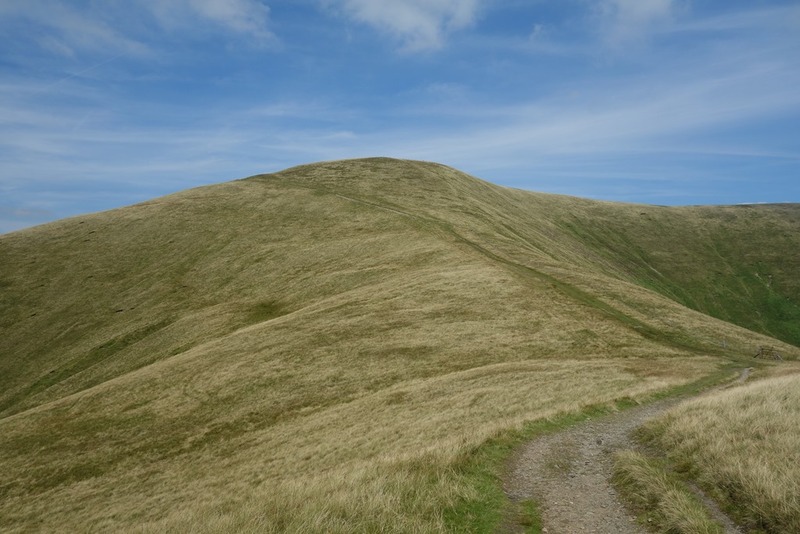 The route to The Calf was effectively along a ridge punctuated with a series of rounded peaks. We had the option of by-passing the first of these, Arant Haw – at 1989 feet just short of being able to call itself a “mountain” – but decided to tackle it anyway. 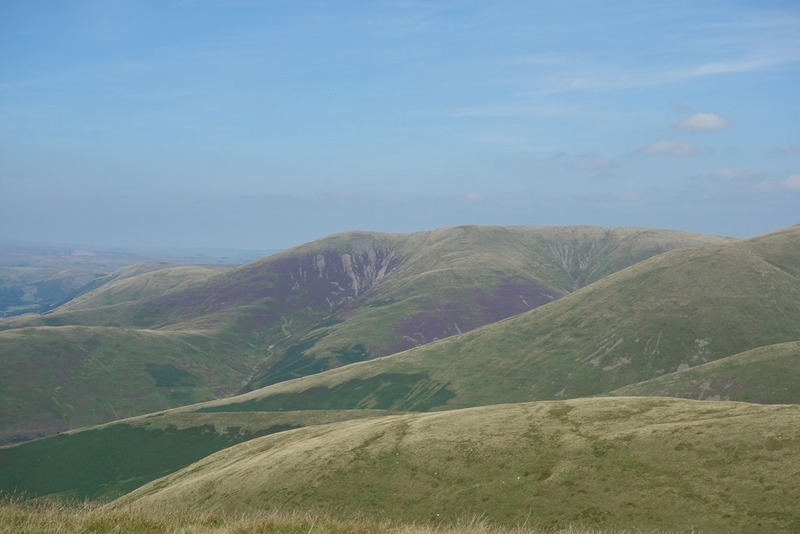 From the summit there were superb views of the surrounding fells. 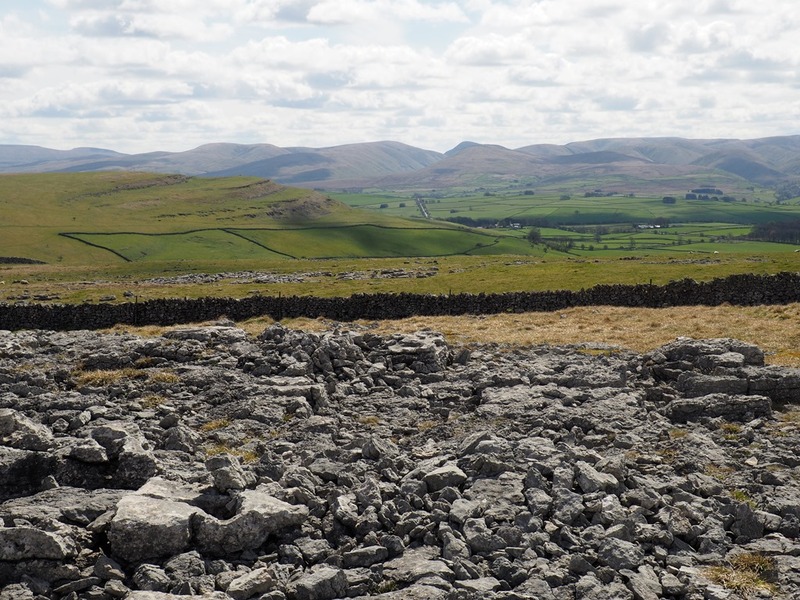 Unfortunately there was a heat haze which obscured the main Lakeland peaks although looking south we we could make out the hills of the Yorkshire Dales. After eating our sandwiches we set off again towards our next objective, Calders. 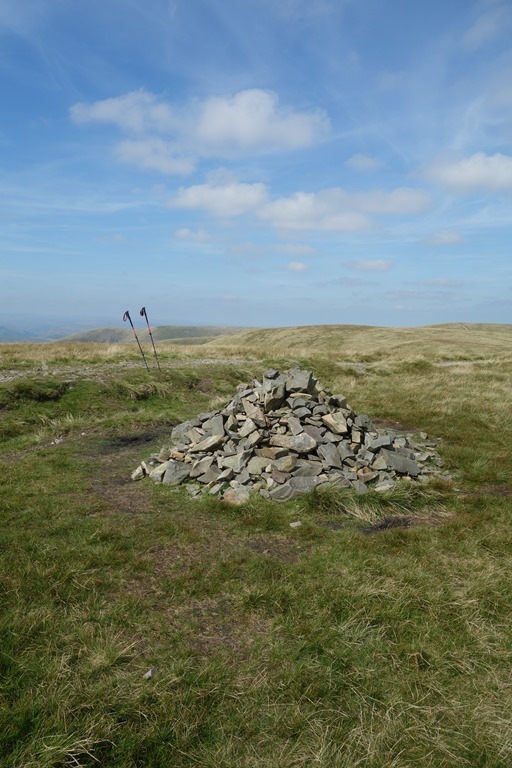 This involved losing some height before climbing a steepish slope up to the summit. We made it to the summit, which at 2211 feet is only a little lower than The Calf itself. 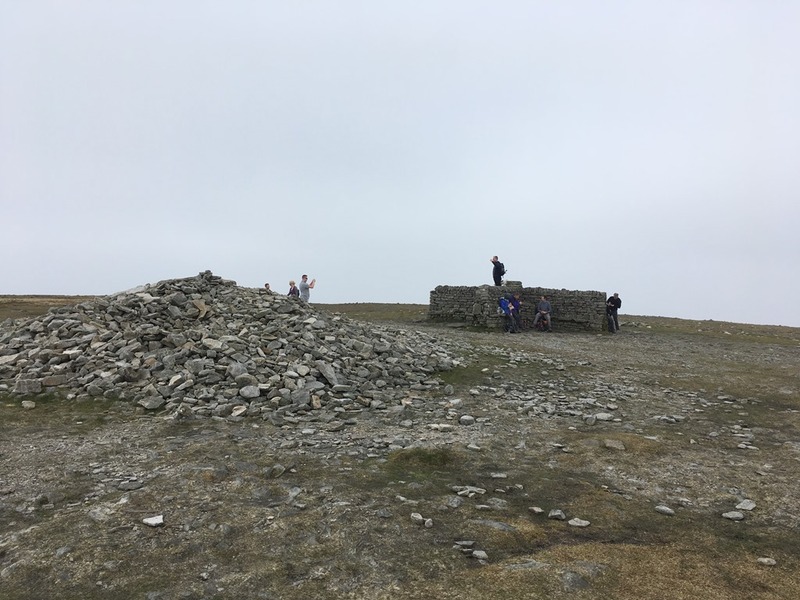 It didn’t take too long to reach the summit of the Calf. 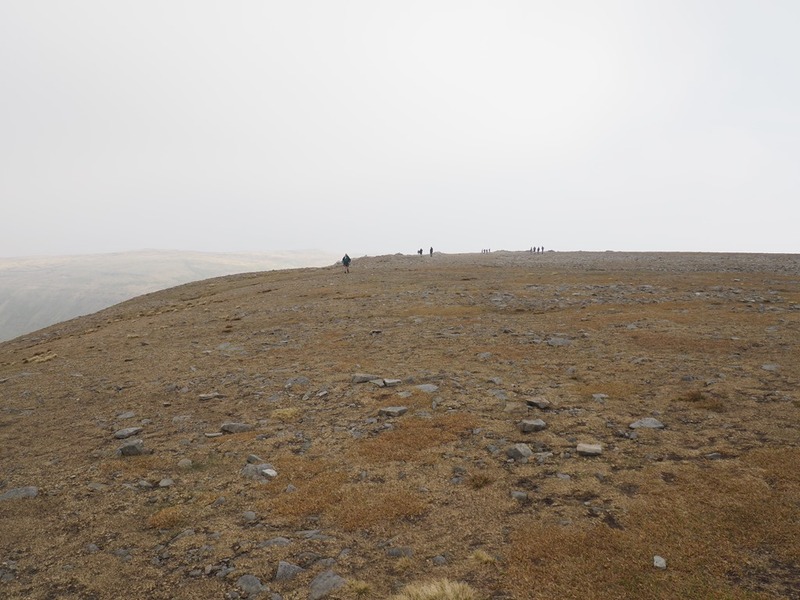 It was a little bit of an anti-climax as the summit is a flat plateau which doesn’t have definite peak. 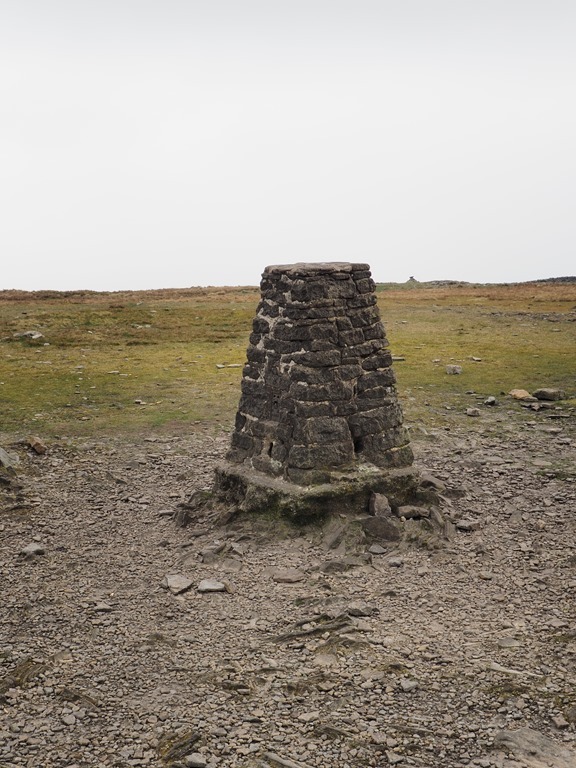 but there is a trig point marking the high point – 2218 feet – and a small tarn. 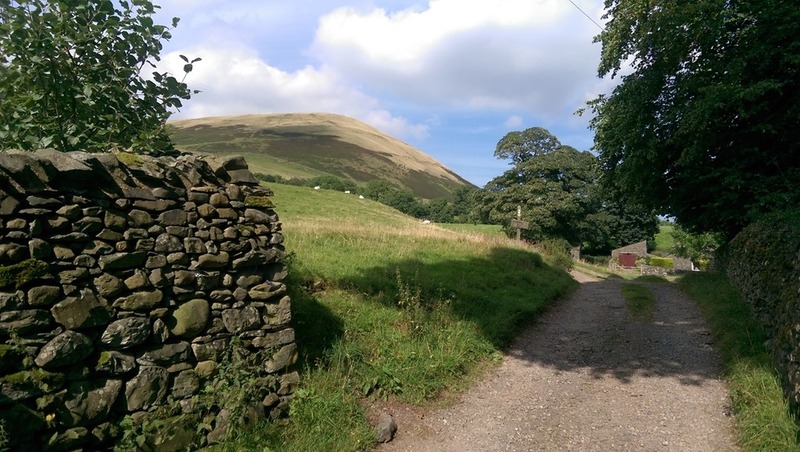 After taking the obligatory photos and more refreshments we set off back to Sedbergh. 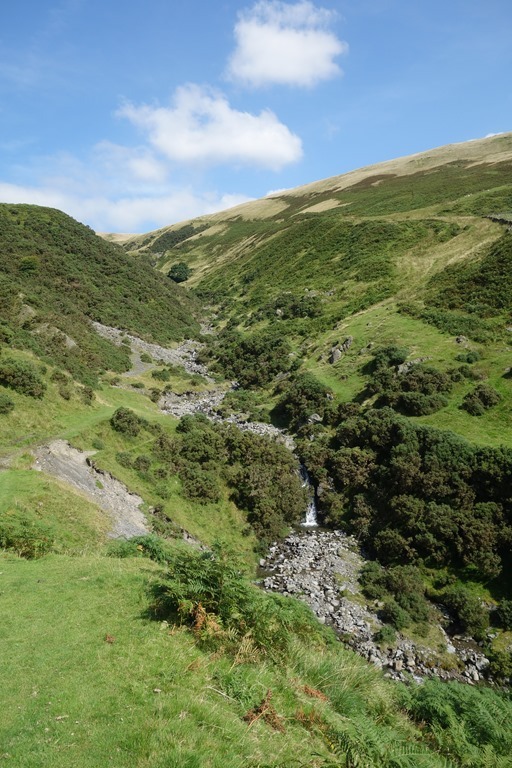 Although it is possible to work out a circular route this would have extended the walk by several miles and we’d decided to head back by retracing our footsteps – well, more or less as we decided to bypass Arant Haw on the return journey. 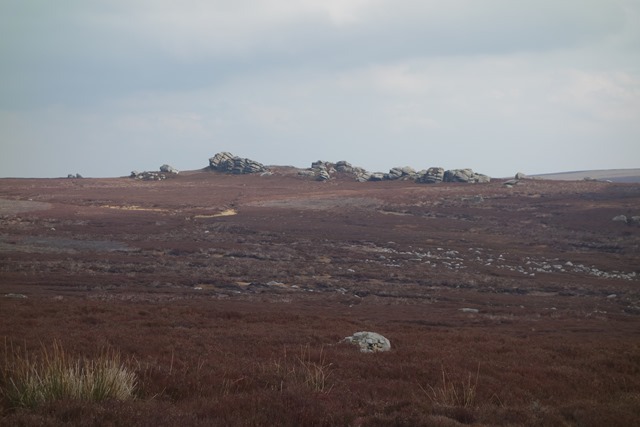 The route wasn’t a disappointment as different views opened as we worked our way back towards our destination. 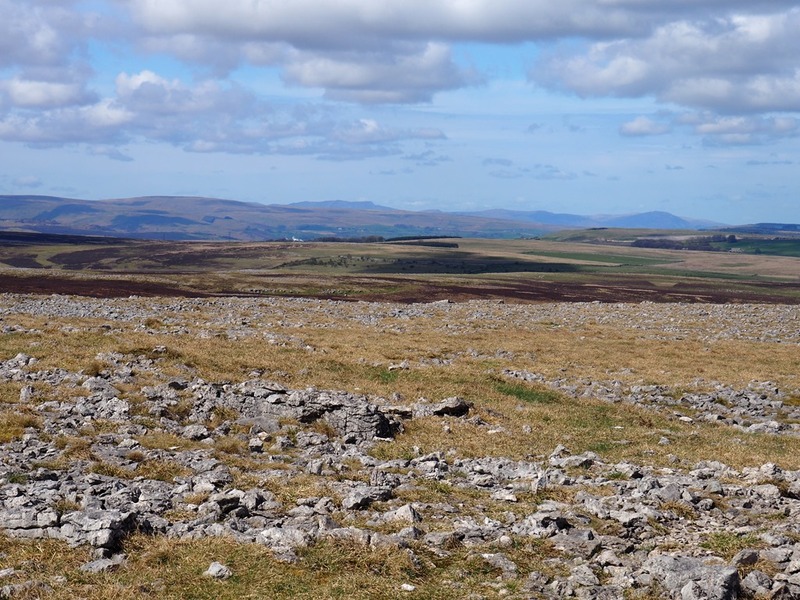 This was the view from the top of Calders, our path clearly visible with the hills of the Yorkshire Dales in the background. 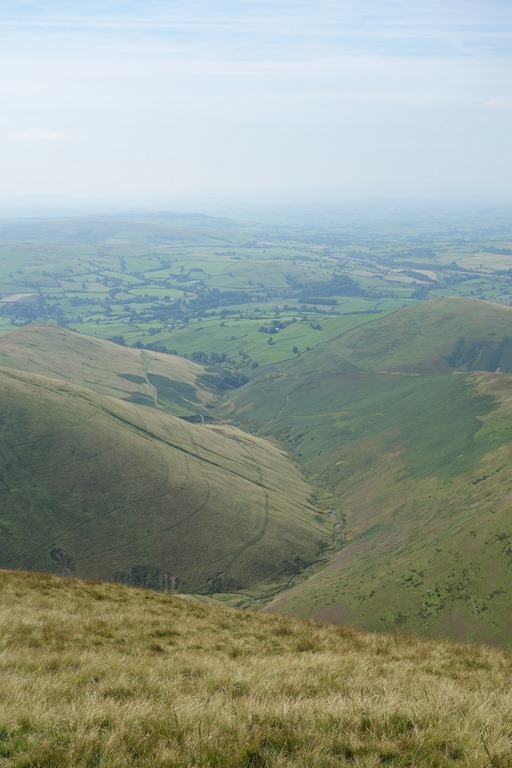 As we approached Settlebeck Gill and the descent from the fells we could see Sedbergh down in the valley. 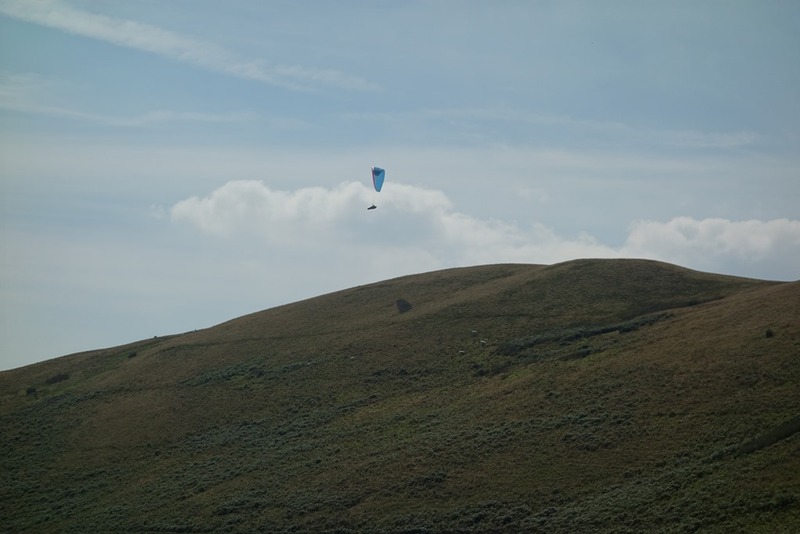 We spotted a para-glider circling Winder as we descended. 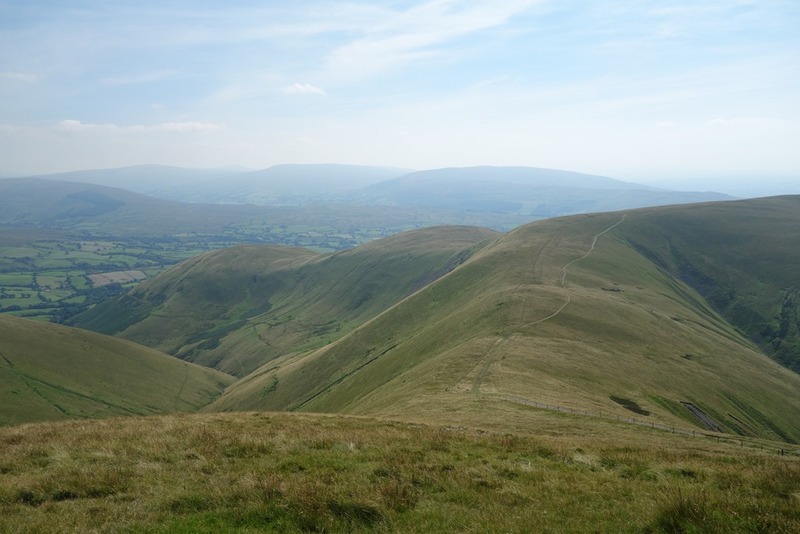 Not far to go to Sedbergh now. A brew awaited! Rough Fell sheep one of the three breeds of sheep native to Cumbria. Soon we were back in the village. We dumped our rucksacks in the boot of the car and set off in search of a café. 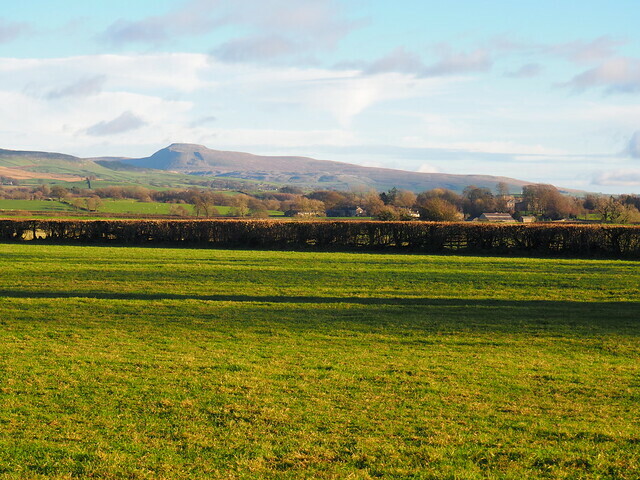 Another enjoyable walk, somewhere we hadn’t visited before, but a brew was needed! 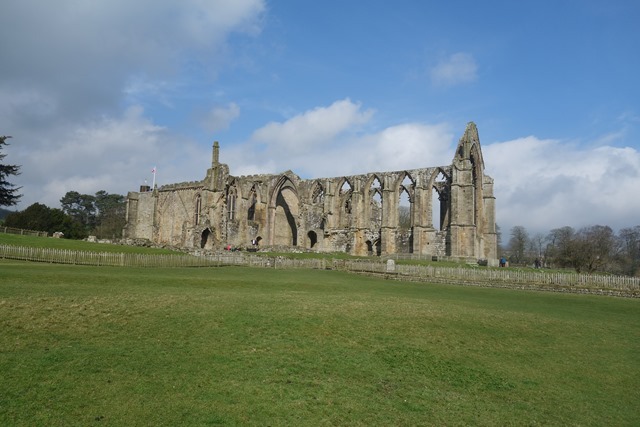 Last Sunday the weather forecast was promising so we decided to drive over to Bolton Abbey and go for a walk. It’s only about 80 minutes drive, but we hadn’t been there for quite some time. 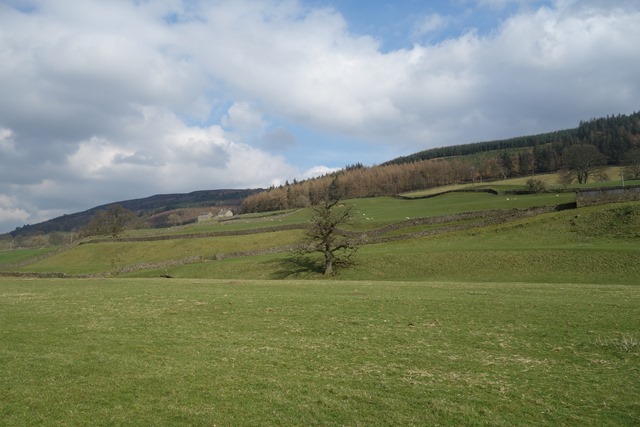 Bolton Abbey Estate is owned by the Devonshire Estate, best known for Chatsworth in Derbyshire, and they’re very commercially savvy, so charge a relatively hefty £8 flat fee for parking. Reasonable if you’re stopping for the day I guess, but a little hefty for a short visit. But the car parks on the estate were busy, so I guess it’s a case of supply and demand. 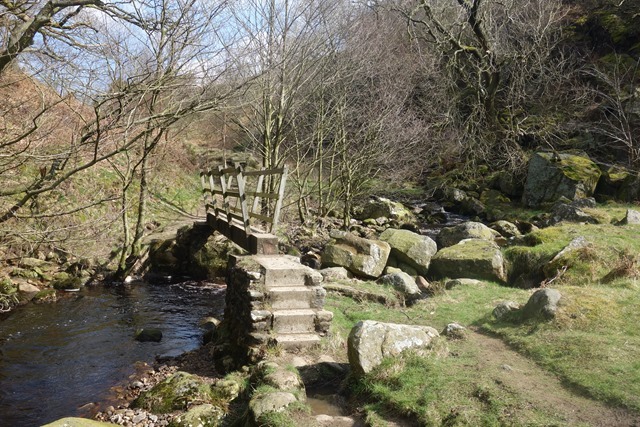 In the past we’d done the circular walk from the Abbey around the river through Strid Wood and back, but this time we decided to try a more challenging walk taking a route over the moors to Simon’s Seat returning along the river. 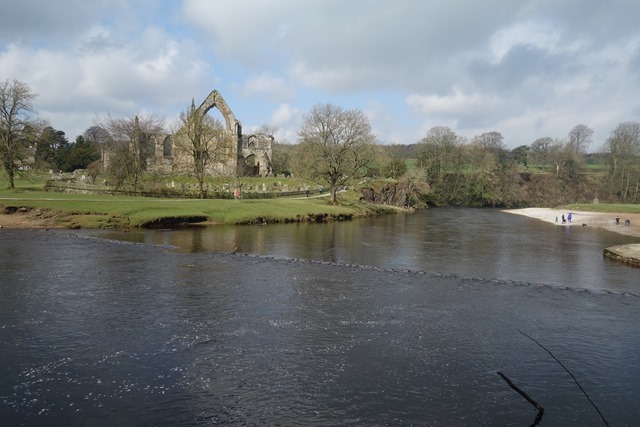 The route description and map is available on the Bolton Abbey website. It starts from the Cavendish Lodge car park but we decided to lengthen it a little by setting out from near the old ruined Abbey. 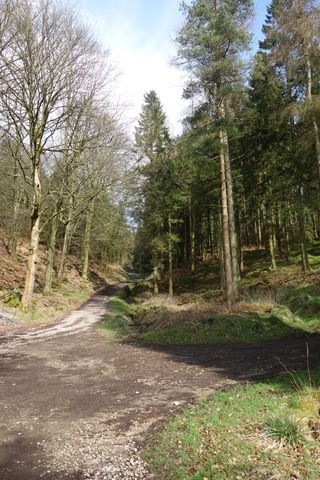 About 10 or 11 miles in total passing through varying countryside – a pleasant river valley, woodland and peat moorland. 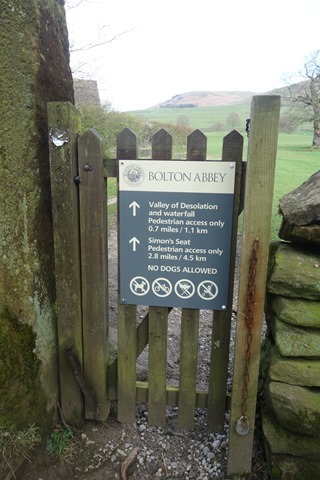 Then we went through the Gate heading towards “The Valley of Desolation”. 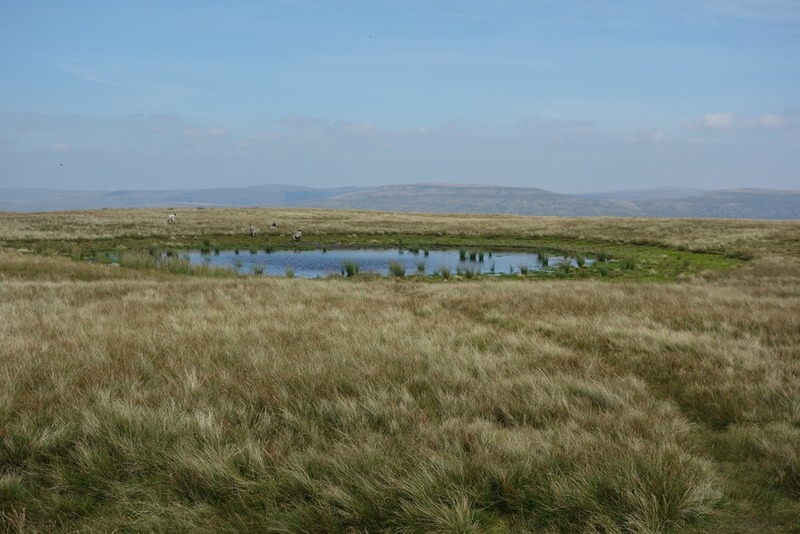 and then on to the open moor. 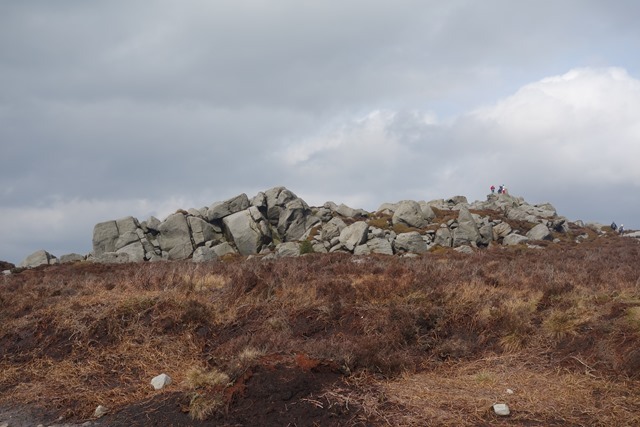 We crossed the moor which is dotted with outcrops of millstone grit. 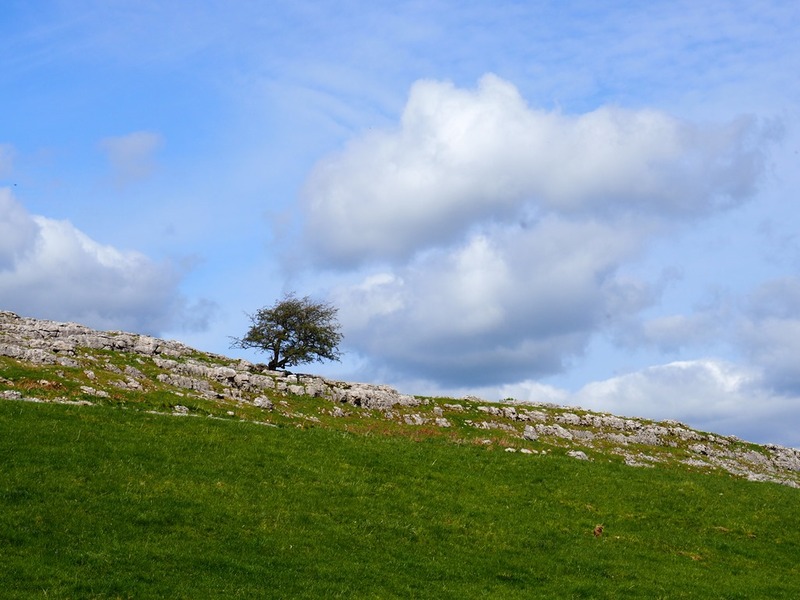 Cloud had come in obscuring the sun and it had become rather chilly but we stopped for a while to take in the dramatic views over Wharfedale and beyond. 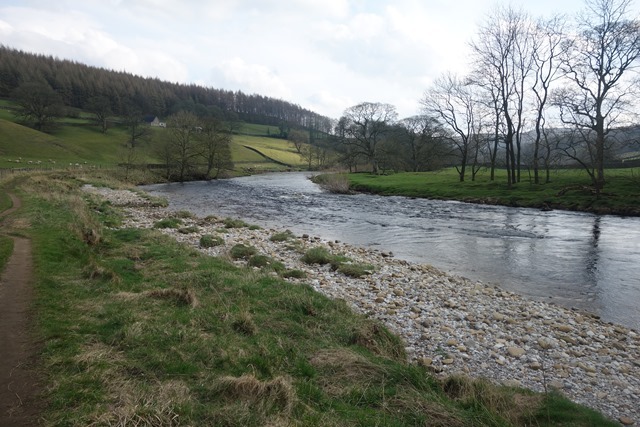 We took the footpath following the rive back downstream. 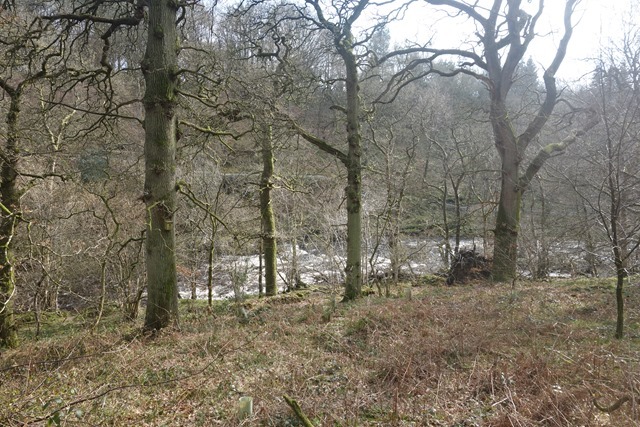 Eventually we reached Barden Bridge and the start of Strid Woods. 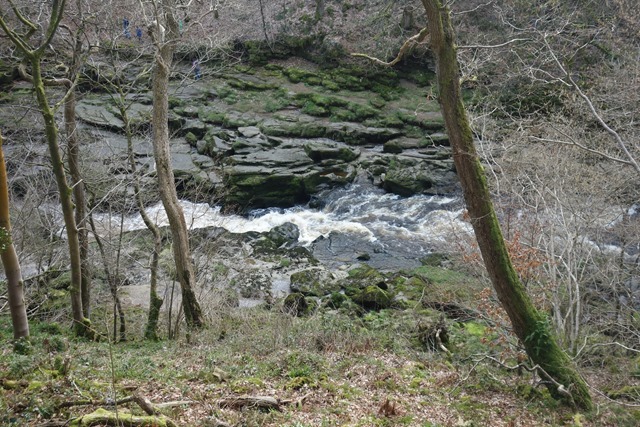 Here the river passes through a rocky gorge, becoming narrower, deeper and faster. 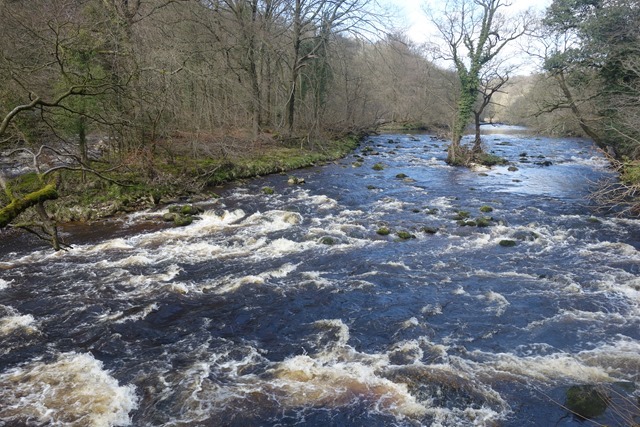 The Strid, after which the woods are named, is a particularly narrow, turbulent and infamous section of the river. Eventually we reached the Cavendish Pavilion where we stopped for a re-energising coffee. 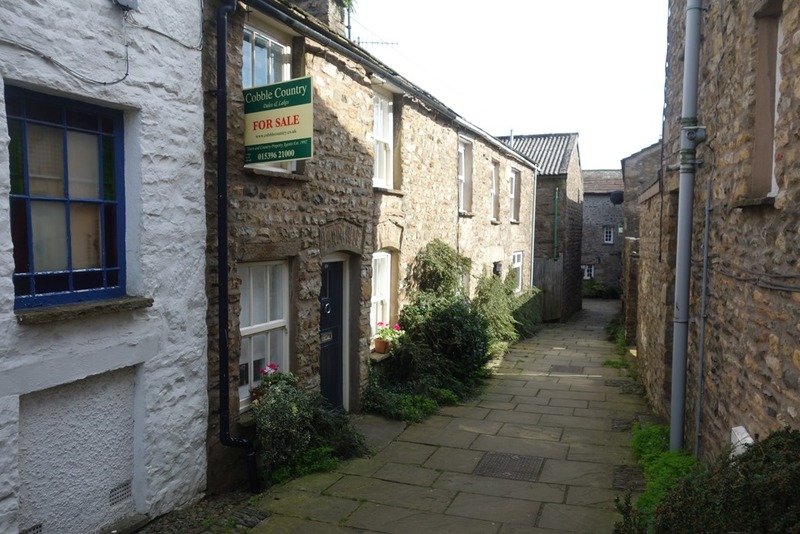 and then through the village to the car park ready to drive home.